I recently read about a novel approach to stopping chinese hackers. My security alerts me of all the hacking attempts by their IP etc. The 2 most common places where hack attempts originate is #1 China and #2 Turkey. I have decided to let the great firewall of China try and do the work for me so I am setting this post up which includes the information of wikipedia on the Tiananmen Square incident. Hopefully China’s own ISPs will read this page and block all nationals from accessing it. Tank Man! The power to stop 4 tanks with only a shopping bag. The 1989 Tiananmen Square protests, commonly known in mainland China as the June Fourth Incident (Chinese: 六四事件, liùsì shìjiàn), were student-led demonstrations in Beijing (the capital of the People’s Republic of China) in 1989. More broadly, it refers to the popular national movement inspired by the Beijing protests during that period, sometimes called the ’89 Democracy Movement (Chinese: 八九民运, bājiǔ mínyùn). The protests were forcibly suppressed after Chinese PremierLi Peng declared martial law. In what became known in the West as the Tiananmen Square Massacre, troops with assault rifles and tanks fired at the demonstrators trying to block the military’s advance towards Tiananmen Square. The number of civilian deaths was internally estimated by the Chinese government to be near or above 10,000. Set against a backdrop of rapid economic development and social changes in post-Mao Zedong China, the protests reflected anxieties about the country’s future in the popular consciousness and among the political elite. The reforms of the 1980s had led to a nascent market economy which benefited some people but seriously disaffected others, and the one-party political system also faced a challenge of legitimacy. Common grievances at the time included inflation, limited preparedness of graduates for the new economy, and restrictions on political participation. The students called for democracy, greater accountability, freedom of the press, and freedom of speech, although they were loosely organized and their goals varied. At the height of the protests, about 1 million people assembled in the Square. As the protests developed, the authorities veered back and forth between conciliatory and hardline tactics, exposing deep divisions within the party leadership. By May, a student-led hunger strike galvanized support for the demonstrators around the country, and the protests spread to some 400 cities. Ultimately, China’s paramount leaderDeng Xiaoping and other Communist Partyelders believed the protests to be a political threat and resolved to use force. The State Council declared martial law on May 20 and mobilized as many as 300,000 troops to Beijing. The troops suppressed the protests by firing at demonstrators with automatic weapons, killing multiple protesters and leading to mass civil unrest in the days following. The international community, human rights organizations, and political analysts condemned the Chinese government for the massacre. Western countries imposed arms embargoes on China. The Chinese government made widespread arrests of protesters and their supporters, suppressed other protests around China, expelled foreign journalists, strictly controlled coverage of the events in the domestic press, strengthened the police and internal security forces, and demoted or purged officials it deemed sympathetic to the protests. More broadly, the suppression temporarily halted the policies of liberalization in the 1980s. Considered a watershed event, the protests also set the limits on political expression in China well into the 21st century. Its memory is widely associated with questioning the legitimacy of Communist Party rule and remains one of the most sensitive and most widely censored political topics in mainland China. Events named by date in Chinese are conventionally named by the number of the month and the date, followed by the type of event. Thus, the common Chinese name for the crackdown on the 1989 massacre is June Fourth Incident (Chinese: 六四事件, liùsì shìjiàn). The nomenclature of the former is consistent with the customary names of the other two great protests that occurred in Tiananmen Square: the May Fourth Movement of 1919 and the April Fifth Movement of 1976. June Fourth refers to the day on which the People’s Liberation Army cleared Tiananmen Square of protesters, although actual operations began on the evening of 4 June. Names such as June Fourth Movement (Chinese: 六四运动, liù-sì yùndòng) and ’89 Democracy Movement (Chinese: 八九民运, bā-jiǔ mínyùn) are used to describe the event in its entirety. Outside mainland China, and among circles critical of the crackdown within mainland China, it is commonly referred to in Chinese as June Fourth Massacre (Chinese: 六四屠杀, liù-sì túshā) and June Fourth Crackdown (Chinese: 六四镇压, liù-sì zhènyā). To bypass internet censorship in China, which uniformly considers all the above-mentioned names too ‘Sensitive’ for search engines and public forums, alternative names have sprung up to describe the events on the Internet, such as May 35th, VIIV (Roman numerals for 6 and 4) and Eight Squared (i.e. 82 = 64). The government of the People’s Republic of China have used numerous names for the event since 1989, gradually reducing the intensity of terminology applied. As the events were unfolding, it was labelled a “counterrevolutionary riot”, which was later changed to simply “riot”, followed by “political storm” and finally the leadership settled on the more neutralized phrase “political turmoil between the Spring and Summer of 1989”, which it uses to this day. In English, the terms Tiananmen Square Massacre, Tiananmen Square Protests or Tiananmen Square Crackdown are often used to describe the series of events. However, much of the violence did not actually happen in Tiananmen, but outside the square in the city of Beijing near the Muxidi area. The term also gives a misleading impression that demonstrations only happened in Beijing, when in fact they occurred in many cities throughout China. (Examples include Chengdu from the account of Louisa Lim’s The People’s Republic of Amnesia). The Cultural Revolution ended with chairman Mao Zedong‘s death in 1976. The movement, spearheaded by Mao, caused severe damage to the country’s originally diverse economic and social fabric. The country was mired in poverty as economic production slowed or came to a halt. Political ideology was paramount in the lives of ordinary people as well as the inner workings of the Communist Party itself. At the Third Plenum of the 11th Central Committee in December 1978, Deng Xiaoping emerged as China’s de facto leader. Deng launched a comprehensive program to reform the Chinese economy. Within several years, the country’s direction entirely changed. The focus on ideological purity was replaced by a full-on drive to achieve material prosperity. To run his reform agenda, Deng promoted his allies to top government and party posts. Hu Yaobang replaced Hua Guofeng as head of the Communist Party from June 1981 (as Chairman, then (when the Chair was abolished) as General Secretary from September 1982), while Zhao Ziyang was named Premier of the People’s Republic of China in September 1980. The reforms aimed to decrease the role of the state in the economy and gradually introduced private forms of production in agriculture and industry. By 1981, roughly 73% of rural farms had de-collectivized and 80% of state owned enterprises were permitted to retain profits. Within a few years, production increased by leaps and bounds, and poverty was reduced substantially. While the reforms were generally well received by the public, concerns grew over a series of social problems that the changes brought about, including corruption and nepotism by elite party bureaucrats. The state-mandated pricing system, in place since the 1950s, had long kept prices stable at low levels. The initial reforms created a two-tier system where some prices were fixed while others were allowed to fluctuate. In a market with chronic shortages, this allowed people with powerful connections to buy goods at low prices and sell at market prices. In addition, the money supply had expanded too fast. At least a third of factories were unprofitable. The government tightened the money supply in 1988, leaving much of the economy without loans. Following the 1988 Beidaihe meeting, the party leadership under Deng agreed to a transition to a market-based pricing system. News of the relaxation of price controls triggered waves of cash withdrawals, buying and hoarding all over China. The government panicked and rescinded the price reforms in less than two weeks, but its impact was pronounced for much longer. Inflation soared. Official indices report that the Consumer Price Index increased 30% in Beijing between 1987 and 1988, leading to panic among salaried workers that they could no longer afford staple goods. Moreover, in the new market economy, unprofitable state-owned enterprises were pressured to cut costs. This threatened a vast proportion of the population which relied on the “iron rice bowl“, i.e. a host of social benefits such as job security, medical care and subsidized housing. Reformist leaders envisioned in 1978 that intellectuals would play a leading role in guiding the country through reforms, but this did not happen as planned. Despite the opening of new universities and increased enrollment, the state-directed education system did not produce enough graduates to meet increased market demand in the areas of agriculture, light industry, services, and foreign investment. The job market was especially limited for students specializing in social sciences and the humanities. Moreover, private companies no longer needed to accept students assigned to them by the state, and many high-paying jobs were offered on the basis of nepotism and favoritism. Gaining a good state-assigned placement meant navigating a highly inefficient bureaucracy that gave power to officials who had little expertise in their area of jurisdiction. Facing a dismal job market and limited chances of going abroad, intellectuals and students had a greater vested interest in political issues. Small study groups, such as the “Democracy Salon” and the “Lawn Salon” (Caodi Shalong), began appearing on Beijing university campuses. These organizations motivated the students to get involved politically. At the same time, the party’s nominally socialist ideology faced a legitimacy crisis as it gradually adopted capitalist practices. Private enterprise gave rise to profiteers who took advantage of lax regulations, and who often flaunted their wealth in front of those who were less well off. Popular discontent was brewing over unfair wealth distribution. Greed, not skill, appeared to be the most crucial factor of success. There was widespread public disillusionment over the country’s future. People wanted change, yet the power to define ‘the correct path’ continued to rest solely in the hands of the unelected government. The comprehensive and wide-ranging reforms created political differences over the pace of marketization and the control over the ideology that came with it, opening a deep chasm within the central leadership. The reformers (“the right”, led by Hu Yaobang) favoured political liberalization and a plurality of ideas as a channel to voice popular discontent, and pressed for further reforms. The conservatives (“the left”, led by Chen Yun) said that the reforms had gone too far, and advocated a return to greater state control to ensure social stability and to better align with the party’s socialist ideology. Both sides needed the backing of paramount leader Deng Xiaoping to carry out important policy decisions. In mid-1986, astrophysics professor Fang Lizhi, who had returned from a position at Princeton University, began a personal tour around universities in China, speaking about liberty, human rights, and separation of powers. Fang was part of a wider undercurrent within the elite intellectual community that thought China’s poverty and underdevelopment and the disaster of the Cultural Revolution were a direct result of the authoritarian political system and the rigid command economy. The view that political reform was the only answer to China’s on-going problems gained widespread appeal among students, as Fang’s recorded speeches became widely circulated all over the country. In response, Deng Xiaoping warned that Fang was blindly worshipping Western lifestyles, capitalism, and multi-party systems, while undermining China’s socialist ideology, traditional values, and the party’s leadership. Inspired by Fang and other ‘people-power’ movements around the world, in December 1986, student demonstrators staged protests against the slow pace of reform. The issues were wide-ranging, and included demands for economic liberalization, democracy, and rule of law. While the protests were initially contained in Hefei, where Fang lived, they quickly spread to Shanghai, Beijing and other major cities. This alarmed the central leadership, who accused the students of instigating Cultural Revolution-style turmoil. General secretary Hu Yaobang was blamed for taking a soft attitude and mishandling the protests, thus undermining social stability. He was denounced thoroughly by conservatives. Hu was forced to resign as general secretary on 16 January 1987. Then the party began the “Anti-bourgeois liberalization Campaign”, taking aim at Hu, political liberalization and Western-inspired ideas in general. The Campaign stopped student protests and tightened the political environment, but Hu remained popular among progressives in the party, intellectuals, and students. When Hu Yaobang suddenly died of a heart attack on 15 April 1989, students reacted strongly, most of them believing that his death was related to his forced resignation. Hu’s death provided the initial impetus for students to gather in large numbers. In university campuses, many posters appeared eulogizing Hu, calling for a revival of Hu’s legacy. Within days, most posters were writing about broader political issues, such as freedom of the press, democracy, and corruption. Small spontaneous gatherings to mourn Hu began on 15 April around Monument to the People’s Heroes at Tiananmen Square. On the same day, many students at Peking University (PKU) and Tsinghua University erected shrines, and joined the gathering in Tiananmen Square in a piecemeal fashion. Organized student gatherings also began on a small scale in Xi’an and Shanghai on 16 April. On 17 April, students at the China University of Political Science and Law (CUPL) made a large wreath to commemorate Hu Yaobang. Its laying-party was on 17 April and a larger-than-expected crowd assembled. At 5 pm, 500 CUPL students reached the eastern gate of the Great Hall of the People, near Tiananmen Square, to mourn Hu. The gathering featured speakers from various backgrounds giving public orations commemorating Hu and discussing social problems. However, it was soon deemed obstructive to the operation of the Great Hall, so police tried to persuade the students to disperse. Affirm Hu Yaobang’s views on democracy and freedom as correct. Admit that the campaigns against spiritual pollution and bourgeois liberalization had been wrong. Publish information on the income of state leaders and their family members. Allow privately run newspapers and stop press censorship. Increase funding for education and raise intellectuals’ pay. End restrictions on demonstrations in Beijing. On the morning of 18 April, students remained in the Square. Some gathered around the Monument to the People’s Heroes singing patriotic songs and listening to impromptu speeches by student organizers, others gathered at the Great Hall. Meanwhile, a few thousand students gathered at Xinhua Gate, the entrance to Zhongnanhai, the seat of the party leadership, where they demanded dialogue with the leadership. Police restrained the students from entering the compound. Students then staged a sit-in. On 20 April, most students had been persuaded to leave Xinhua Gate. To disperse about 200 students that remained, police used batons; minor clashes were reported. Many students felt abused by the police, and rumours about police brutality spread quickly. This incident angered students on campus, where those who were not politically active decided to join the protests. Also on this date, a group of workers calling themselves the Beijing Workers’ Autonomous Federation issued two handbills challenging the central leadership. Hu’s state funeral took place on 22 April. On the evening of 21 April, some 100,000 students marched on Tiananmen Square, ignoring orders from Beijing municipal authorities that the Square was to be closed off for the funeral. The funeral, which took place inside the Great Hall and attended by the leadership, was broadcast live to the students. General secretary Zhao Ziyang delivered the eulogy. The funeral seemed rushed, and only lasted 40 minutes, as emotions ran high in the Square. Students wept. Security cordoned off the east entrance to the Great Hall, but several students pressed forward. Three of these students knelt on the steps of the Great Hall to present a petition and demanded to see Premier Li Peng. However, no leaders emerged from the Great Hall, leaving the students disappointed and angry; some called for a class boycott. On April 21, students began organizing under the banners of formal organizations. On 23 April, the Beijing Students’ Autonomous Federation (also known as the Union) was formed. It elected CUPL student Zhou Yongjun as chair. Wang Dan and Wu’erkaixi also emerged as leaders. From this vantage point, the Union called for a general class boycott at all Beijing universities. Such an independent organization operating outside of party jurisdiction alarmed the leadership. On 22 April, near dusk, serious rioting broke out in Changsha and Xi’an. In Xi’an, arson from rioters destroyed cars and houses, and looting occurred in shops near the city’s Xihua Gate. In Changsha, 38 stores were ransacked by looters. Over 350 people were arrested in both cities. In Wuhan, university students organized protests against the provincial government. As the situation became more volatile nationally, Zhao Ziyang called numerous meetings of the Politburo Standing Committee (PSC). Zhao stressed three points: discourage students from further protests and ask them to go back to class, use all measures necessary to combat rioting, and open forms of dialogue with students at different levels of government. Premier Li Peng called upon Zhao to condemn protestors and recognize the need to take more serious action. Zhao dismissed Li’s views. Despite calls for him to remain in Beijing, Zhao left for a scheduled state visit to North Korea on 23 April. Zhao’s departure to North Korea left Li Peng as the acting executive authority in Beijing. On 24 April, Li Peng and the PSC met with Beijing Party Secretary Li Ximing and mayor Chen Xitong to gauge the situation at the Square. The municipal officials wanted a quick resolution to the crisis and framed the protests as a conspiracy to overthrow China’s political system and major party leaders, including Deng Xiaoping. In Zhao’s absence, the PSC agreed that firm action against protesters must be taken. On the morning of 25 April, President Yang Shangkun and Premier Li Peng met with Deng at the latter’s residence. Deng endorsed a hardline stance and said an appropriate ‘warning’ must be disseminated via mass media to curb further demonstrations. The meeting firmly established the first official evaluation of the protests from the leadership, and highlighted Deng’s having ‘final say’ on important issues. Li Peng subsequently ordered Deng’s views to be drafted as a communique and issued to all high-level Communist Party officials in an effort to mobilize the party apparatus against protesters. On 26 April, the party’s official newspaper People’s Daily issued a front-page editorial titled “It is necessary to take a clear-cut stand against disturbances.” The language in the editorial effectively branded the student movement to be an anti-party, anti-government revolt. The article enraged students, who interpreted it as a direct indictment on the protests and its cause. The editorial backfired. Instead of scaring students into submission, it squarely antagonized the students against the government. The polarizing nature of the editorial made it a major sticking point for the remainder of the protests. The editorial evoked memories of the Cultural Revolution, using similar rhetoric as that used during the 1976 Tiananmen Incident—an event that was initially branded an anti-government conspiracy but was later rehabilitated as “patriotic” under Deng’s leadership. Organized by the Union on 27 April, some 50,000–100,000 students from all Beijing universities marched through the streets of the capital to Tiananmen Square, breaking through lines set up by police, and receiving widespread public support along the way, particularly from factory workers. The student leaders, eager to show the patriotic nature of the movement, also toned down anti-Communist slogans, choosing to present a message of “anti-corruption, anti-cronyism”, but “pro-party”. In a twist of irony, student factions who genuinely called for the overthrow of the Communist Party gained traction as the result of a 26 April editorial. The stunning success of the March forced the government into making concessions and meeting with student representatives. On 29 April, State Council spokesman Yuan Mu (袁木) met with appointed representatives of government-sanctioned student associations. While the talks discussed a wide range of issues, including the editorial, the Xinhua Gate incident and freedom of the press, they achieved few substantive results. Independent student leaders such as Wuer Kaixi refused to attend. The government’s tone grew increasingly conciliatory as Zhao Ziyang returned from Pyongyang on 30 April and resumed his executive authority. In Zhao’s view, the hardliner approach was not working, and concession was the only alternative. Zhao asked that the press be opened to report the movement positively, and delivered two sympathetic speeches on 3–4 May. In the speeches, Zhao said that the student’s concerns about corruption were legitimate, and that the student movement was patriotic in nature. The speeches essentially negated the message presented by 26 April Editorial. While some 100,000 students marched on the streets of Beijing on 4 May to commemorate the May Fourth Movement and repeat demands from earlier marches, many students were satisfied with the government’s concessions. On 4 May, all Beijing universities except PKU and BNU announced the end of the class boycott. Subsequently, the majority of students began to lose interest in the movement. The leadership was divided on how to respond to the movement as early as mid-April. After Zhao Ziyang’s return from North Korea, factional tensions, between the progressive camp and the conservative camp, intensified. Those who supported continued dialogue and a soft approach with students rallied behind Zhao Ziyang, while hardliner conservatives who opposed the movement rallied behind Premier Li Peng. Zhao and Li clashed at a PSC meeting on 1 May. Li maintained that the need for stability overrides all else, while Zhao said that the party should show support for increased democracy and transparency. Zhao pushed the case for further dialogue. In preparation for dialogue, the Autonomous Student Union elected representatives to a formal Dialogue Delegation. However, the Union leaders were reluctant to let the Delegation unilaterally take control of the movement. Facing internal discord and declining engagement from the student body at large, a group of charismatic leaders, including Wang Dan and Wu’erkaixi, called for more radical measures to regain momentum. They believed that the government’s ‘dialogue’ was merely a way to trick the students into submission. They began mobilizing students for a hunger strike on 11 May. Students began the hunger strike on 13 May, two days before the highly publicized state visit by Soviet leader Mikhail Gorbachev. Knowing that the welcoming ceremony for Gorbachev was scheduled to be held on the Square, student leaders wanted to use the hunger strike there to force the government into meeting their demands. Moreover, the hunger strike gained widespread sympathy from the population at large and earned the student movement the moral high ground that it sought. By the afternoon of 13 May, some 300,000 were gathered at the Square. Inspired by the course of events in Beijing, protests and strikes began at universities in other cities, with many students traveling to Beijing to join the demonstration. Generally, the demonstration at Tiananmen Square was well ordered, with daily marches of students from various Beijing-area colleges displaying their solidarity with the class boycott and with the demands of the protest. The students sang The Internationale, the world socialist anthem, on their way to, and at, the square. Afraid that the movement would spin out of control, Deng Xiaoping asked that the Square be cleared for Gorbachev’s visit. Executing Deng’s request, Zhao again used a soft approach, and directed his subordinates to coordinate negotiations with students immediately. Zhao believed he could appeal to the students’ patriotism, and that the students understood signs of internal turmoil during the Sino-Soviet summit would embarrass the nation (not just the government). On the morning of 13 May, Yan Mingfu, head of the Communist Party’s United Front, called an emergency meeting, gathering prominent student leaders and intellectuals, including Liu Xiaobo, Chen Ziming and Wang Juntao. Yan said the government was prepared to hold immediate dialogue with student representatives, but that the Tiananmen welcoming ceremony for Gorbachev would be cancelled whether the students withdraw or not—in effect removing the bargaining power the students thought they possessed. The announcement sent the student leadership into disarray. Press restrictions were loosened significantly during early to mid-May. State media began broadcasting footage sympathetic to protesters and the movement, including the hunger strikers. On 14 May, intellectuals led by Dai Qing gained permission from Hu Qili to bypass government censorship and air the progressive views of the nation’s intellectuals on Guangming Daily. The intellectuals then issued an urgent appeal for the students to leave the Square in an attempt to deescalate the conflict. However, many students believed that the intellectuals were speaking for the government, and refused to move. That evening, formal negotiations took place between government representatives led by Yan Mingfu and student representatives led by Shen Tong and Xiang Xiaoji. Yan affirmed the patriotic nature of the student movement and pleaded for the students to withdraw from the Square. While Yan’s apparent sincerity for compromise satisfied some students, the meeting grew increasingly chaotic as competing student factions relayed uncoordinated and incoherent demands to the leadership. Shortly after student leaders learned that the event had not been broadcast nationally as initially promised by the government, the meeting fell apart. Yan then personally went to the Square to appeal to the students, even offering himself to be held hostage. Yan also took the student’s pleas to Li Peng the next day, asking Li to consider formally retracting the 26 April Editorial and rebranding the movement as “patriotic and democratic”; Li refused. The students remained in the Square during the Gorbachev visit; his welcoming ceremony was held at the airport. The Sino-Soviet summit, the first of its kind in some 30 years, marked the normalization of Sino-Soviet relations, and was seen as a breakthrough of tremendous historical significance for China’s leaders. However, its smooth proceedings was derailed by the student movement; according to one scholar, this embarrassed the leadership on the global stage, and drove many moderates in government onto a more ‘hardliner’ path. The summit between Deng and Gorbachev took place at the Great Hall of the People amid the backdrop of commotion and protest in the Square. When Gorbachev met with Zhao on 16 May, Zhao told him, and by extension the international press, that Deng was still the ‘paramount authority’ in China. Deng felt that this remark was Zhao’s attempt to shift blame for mishandling the movement to him. The statement marked a decisive split between the country’s two most senior leaders. The hunger strike galvanized support for the students and aroused sympathy across the country. Around a million Beijing residents from all walks of life demonstrated in solidarity from 17–18 May. These included PLA personnel, police officers, and lower party officials. Many grassroots Party and Youth League organizations, as well as government-sponsored labour unions, encouraged their membership to demonstrate. In addition, several of China’s non-Communist parties sent a letter to Li Peng in support of students. The Chinese Red Cross issued a special notice and sent in a large number of personnel to provide medical services to the hunger strikers on the Square. After the departure of Mikhail Gorbachev, many foreign journalists remained in the Chinese capital to cover the protests, giving the movement international spotlight. Western governments urged Beijing to exercise restraint. The movement, on the wane at the end of April, now regained significant momentum. By 17 May, as students from across the country poured into the capital to join the movement, protests of varying sizes were occurring in some 400 Chinese cities. Students demonstrated at provincial party headquarters in Fujian, Hubei, and Xinjiang. Without a clearly articulated official position from the Beijing leadership, local authorities did not know how to respond. Because the demonstrations now included a wide array of social groups, each carrying its own set of grievances, it became increasingly unclear with whom the government should negotiate, and what the demands were. The government, still split on how to deal with the movement, saw its authority and legitimacy gradually erode as the hunger strikers took the limelight and gained widespread sympathy. These combined circumstances put immense pressure on the authorities to act, and martial law was discussed as a viable response. The situation seemed intractable, so the weight of taking decisive action fell on paramount leader Deng Xiaoping. On 17 May, a PSC meeting was called at Deng’s residence. At the meeting, Zhao Ziyang’s concessions-based strategy, which called for the retraction of the April 26 Editorial, was thoroughly criticized. Li Peng and Deng asserted that by making a conciliatory speech on 4 May, Zhao exposed divisions within the top leadership and emboldened the students. Deng warned that if Beijing was not pacified quickly, the country risked civil war and another Cultural Revolution; his views were echoed by the party elders. Deng then moved to declare martial law as a show of the government’s no-tolerance stance. To justify martial law, the demonstrators were described as tools of “bourgeois liberalism” advocates who were pulling the strings behind the scenes, as well as tools of elements within the party who wished to further their personal ambitions. Students, we came too late. We are sorry. You talk about us, criticize us, it is all necessary. The reason that I came here is not to ask you to forgive us. All I want to say is that students are getting very weak, it is the 7th day since you went on hunger strike, you can’t continue like this. […] You are still young, there are still many days yet to come, you must live healthy, and see the day when China accomplishes the four modernizations. You are not like us, we are already old, it doesn’t matter to us any more. On the evening of 17 May, the PSC met at Zhongnanhai to finalize plans for martial law. At the meeting, Zhao announced that he was ready to “take leave”, citing he could not bring himself to carry out martial law. The elders in attendance at the meeting, Bo Yibo and Yang Shangkun, urged the PSC to follow Deng’s orders. Zhao did not consider the inconclusive PSC vote to have legally binding implications on martial law; Yang Shangkun, in his capacity as Vice Chairman of the Central Military Commission, went on to mobilize the military to move into the capital. Li Peng met with students for the first time on 18 May in an attempt to placate public concern over the hunger strike. During the talks, student leaders again demanded that the government rescind the 26 April Editorial and affirm the student movement as “patriotic”. Li Peng said the government’s main concern was sending hunger strikers to hospital. The discussions yielded little substantive results, but gained student leaders prominent airtime on national television. In the early morning of 19 May, Zhao Ziyang went to Tiananmen in what became his political swan song (final effort). He was accompanied by Wen Jiabao. Li Peng also went to the Square, but left shortly thereafter. At 4:50 am Zhao made a speech with a bullhorn to a crowd of students, urging the students to end the hunger strike. He told the students that they were still young and urged them to stay healthy and not to sacrifice themselves without due concern for their futures. Zhao’s emotional speech was applauded by some students. It would be his last public appearance. On 19 May, the PSC met with military leaders and party elders. Deng presided over the meeting and said that martial law was the only option. At the meeting Deng declared that he was ‘mistaken’ in choosing Hu Yaobang and Zhao Ziyang as his successors, and resolved to remove Zhao from his position as general secretary. Deng also vowed to deal resolutely with Zhao’s supporters and begin propaganda work. University students in Shanghai also took to the streets to commemorate the death of Hu Yaobang and protest against certain policies of the government. In many cases, these were supported by the universities’ Party committees. Jiang Zemin, then-Municipal Party Secretary, addressed the student protesters in a bandage and ‘expressed his understanding’ as he was a former student agitator before 1949. At the same time, he moved swiftly to send in police forces to control the streets and to purge Communist Party leaders who had supported the students. On April 19, the editors of the World Economic Herald, a magazine close to reformists, decided to publish a commemorative section on Hu. Inside was an article by Yan Jiaqi, which commented favourably on the Beijing student protests, and called for a reassessment of Hu’s 1987 purge. Sensing the conservative political trends in Beijing, Jiang Zemin demanded that the article be censored. Many newspapers were printed with a blank page. Jiang then suspended Qin Benli. His decisive action earned accolades from party elders, who praised Jiang’s loyalty. In Hong Kong on 27 May, over 300,000 people gathered at Happy Valley Racecourse for a gathering called Democratic songs dedicated for China (Chinese: 民主歌聲獻中華). Many Hong Kong celebrities sang songs and expressed their support for the students in Beijing. The following day, a procession of 1.5 million people, one fourth of Hong Kong’s population, led by Martin Lee, Szeto Wah and other organization leaders, paraded through Hong Kong Island. Across the world, especially where ethnic-Chinese lived, people gathered and protested. Many governments, including those of the United States and Japan, issued travel warnings to China. The Chinese government declared martial law on 20 May and mobilized at least 30 divisions from five of the country’s seven military regions. At least 14 of PLA’s 24 army corps contributed troops. As many as 250,000 troops were eventually sent to the capital, some arriving by air and others by rail. Guangzhou’s civil aviation authorities put regular airline tickets on hold to prepare for transporting military units. The army’s entry into the city was blocked at its suburbs by throngs of protesters. Tens of thousands of demonstrators surrounded military vehicles, preventing them from either advancing or retreating. Protesters lectured soldiers and appealed to them to join their cause; they also provided soldiers with food, water, and shelter. Seeing no way forward, the authorities ordered the army to withdraw on 24 May. All government forces retreated to bases outside the city. While the Army’s withdrawal was initially seen as ‘turning the tide’ in favour of protesters, in reality mobilization took place across the country for a final assault. On 1 June, Li Peng issued a report titled “On the True Nature of the Turmoil”, which was circulated to every member of the Politburo. The report aimed to persuade the Politburo of the necessity and legality of clearing Tiananmen Square by referring to the protestors as terrorists and counterrevolutionaries. The report stated that turmoil was continuing to grow, the students had no plans to leave, and they were gaining popular support. Further justification for martial law came in the form of a report submitted by the Ministry of State Security (MSS) to the party leadership, which emphasized the infiltration of bourgeois liberalism into China and the negative effect that the West, particularly the United States, had on the students. The MSS expressed its belief that American forces had intervened in the student movement in hopes of overthrowing the Communist Party. The report created a sense of urgency within the party, and provided justification for military action. In conjunction with the plan to clear the Square by force, the Politburo received word from the martial law troops headquarters stating that the troops were ready to help stabilize the capital, and that they understood the necessity and legality of martial law to overcome the turmoil. On 2 June, the movement saw an increase in action and protest, solidifying the CPC’s decision that it was time to act. Protests broke out as newspapers published articles that called for the students to leave Tiananmen Square and end the movement. Many of the students in the Square were not willing to leave and were outraged by the articles. They were also outraged by Beijing Daily’s 1 June article “Tiananmen, I Cry for You”, written by a fellow student who had become disillusioned with the movement, as he thought it was chaotic and disorganized. In response to the articles, thousands of students lined the streets of Beijing to protest against leaving the Square. Three intellectuals, Liu Xiaobo, Zhou Duo, Gao Xin and a Taiwanese singer Hou Dejian declared a second hunger strike because they wanted to revive the pro-democracy movement. After weeks of occupying the Square, the students were tired, and internal rifts opened between moderate and hardliner student groups. In their declaration speech, the hunger strikers openly criticized the government’s suppression of the movement to remind the students that their cause was worth fighting for, and pushed them to continue their occupation of the Square. On 2 June, Deng Xiaoping and several party elders met with the three remaining politburo standing committee members, Li Peng, Qiao Shi and Yao Yilin, after Zhao Ziyang and Hu Qili had been ousted and agreed to clear the Square so “the riot can be halted and order be restored to the Capital.” They also agreed that the Square needed to be cleared as peacefully as possible, but if protesters did not cooperate, the troops were authorized to use force to complete the job. That day, state-run newspapers reported that troops were positioned in ten key areas in the city. Units of the 27th, 65th and the 24th Armies were secretly moved into the Great Hall of the People on the west side of the Square and the Ministry of Public Security compound east of the Square. On the evening of 2 June, reports that an army trencher ran into four civilians, killing three sparked fear that the army and the police were trying to advance into Tiananmen Square. Student leaders issued emergency orders to set up roadblocks at major intersections to prevent the entry of troops into the center of the city. On the morning of 3 June, students and residents discovered troops dressed in plainclothes trying to smuggle weapons into the city. The students seized and handed the weapons to Beijing Police. The students protested outside the Xinhua Gate of the Zhongnanhai leadership compound and the police fired tear gas. Unarmed troops emerged from the Great Hall of the People and were quickly met with crowds of protesters. Several protesters tried to injure the troops as they collided outside the Great Hall of the People, forcing soldiers to retreat, but only for a short while. The operation to quell the counterrevolutionary riot was to begin at 9 pm. Military units should converge on the Square by 1 am on June 4 and the Square must be cleared by 6 am. The order did not explicitly contain a shoot-to-kill directive but permission to “use any means” was understood by some units as authorization to use lethal force. That evening, the leaders monitored the operation from the Great Hall of the People and Zhongnanhai. On the evening of 3 June, state-run television warned residents to stay indoors but crowds of people took to the streets, as they had two weeks before, to block the incoming army. PLA units advanced on Beijing from every direction—the 38th, 63rd and 28th Armies from the west, the 15th Airborne Corps, 20th, 26th and 54th Armies from the south, the 39th Army and the 1st Armored Division from the east and the 40th and 64th Armies from the north. At about 10 pm, the 38th Army opened fire on protesters at the Wukesong intersection on Chang’an Avenue, about 10 km west of Square. The crowds were stunned that the army was using live ammunition and reacted by hurling insults and projectiles. Song Xiaoming, a 32-year-old aerospace technician, killed at Wukesong, was the first confirmed fatality of the night. The troops used expanding bullets, prohibited by international law for use in warfare, which expand upon entering the body and create larger wounds. At about 10:30 pm, the advance of the army was briefly halted at Muxidi, about 5 km west of the Square, where articulatedtrolleybuses were placed across a bridge and set on fire. Crowds of residents from nearby apartment blocks tried to surround the military convoy and halt its advance. The 38th Army again opened fire, inflicting heavy casualties. According to the tabulation of victims by Tiananmen Mothers, 36 people died at Muxidi, including Wang Weiping, a doctor tending to the wounded. Several were killed in the apartments of high-ranking party officials overlooking the boulevard. Soldiers raked the apartment buildings with gunfire, and some people inside or on their balconies were shot. The 38th Army also used armored personnel carriers (APCs) to ram through the buses. They continued to fight off demonstrators, who hastily erected barricades and tried to form human chains. As the army advanced, fatalities were recorded all along Chang’an Avenue, at Nanlishilu, Fuxingmen, Xidan, Liubukou and Tiananmen. Among those killed was Duan Changlong, a Tsinghua University graduate student, who was shot in the chest as he tried to negotiate with soldiers at Xidan. To the south, paratroopers of the 15th Airborne Corps also used live ammunition, and civilian deaths were recorded at Hufangqiao, Zhushikou, Tianqiao, and Qianmen. The killings infuriated city residents, some of whom attacked soldiers with sticks, rocks and molotov cocktails, setting fire to military vehicles. The Chinese government and its supporters have tried to argue that the troops acted in self-defense and seized upon troop casualties to justify the use of force. Lethal attacks on troops occurred after the military had opened fire at 10 pm on June 3 and the number of military fatalities caused by protesters is relatively few—seven, according to Wu Renhua‘s study, compared to hundreds of civilian deaths. At 8:30 pm, army helicopters appeared above the Square and students called for campuses to send reinforcements. At 10 pm, the founding ceremony of the Tiananmen Democracy University was held as scheduled at the base of the Goddess of Democracy. At 10:16 pm, the loudspeakers controlled by the government warned that troops may take “any measures” to enforce martial law. By 10:30 pm, news of bloodshed to the west and south of the city began trickling into the Square, often told by witnesses drenched in blood. At midnight, the students’ loudspeaker announced news that a student had been killed on West Chang’an Avenue, near the Military Museum and a somber mood settled on the Square. Li Lu, the deputy commander of the student headquarters, urged students to remain united in defending the Square through non-violent means. At 12:30 am, Wu’erkaixi fainted after learning that a female student at Beijing Normal University, who had left campus with him earlier in the evening, had just been killed. Wuerkaixi was taken away by ambulance. By then, there were still 70,000–80,000 people in the Square. At about 12:15 am, a flare lit up the sky and the first armored personnel vehicle appeared on the Square from the west. At 12:30 am, two more APCs arrived from the South. The students threw chunks of concrete at the vehicles. One APC stalled, perhaps by metal poles jammed into its wheels, and the demonstrators covered it with gasoline-doused blankets and set it on fire. The intense heat forced out the three occupants, who were swarmed by demonstrators. The APCs had reportedly run over tents and many in the crowd wanted to beat the soldiers. But students formed a protective cordon and escorted the three men to the medic station by the History Museum on the east side of the Square. Pressure mounted on the student leadership to abandon non-violence and retaliate against the killings. At one point, Chai Ling picked up the megaphone and called on fellow students to prepare to “defend themselves” against the “shameless government.” However, she and Li Lu agreed to adhere to peaceful means and had the students’ sticks, rocks and glass bottles confiscated. At about 2:30 am, several workers near the Monument emerged with a machine gun they had captured from the troops and vowed to take revenge. They were persuaded to give up the weapon by Hou Dejian. The workers also handed over an assault rifle without ammunition, which Liu Xiaobo smashed against the marble railings of the Monument. Shao Jiang, a student who had witnessed the killings at Muxidi, pleaded with the older intellectuals to retreat, saying too many lives had been lost. Initially, Liu Xiaobo was reluctant, but eventually joined Zhou Tuo, Gao Xin and Hou Dejian in making the case to the student leaders for a withdrawal. Chai Ling, Li Lu and Feng Congde initially rejected the idea of withdrawal. At 3:30 am, at the suggestion of two doctors in the Red Cross camp, Hou Dejian and Zhuo Tuo agreed to try to negotiate with the soldiers. They rode in an ambulance to the northeast corner of the Square and spoke with Ji Xinguo, the political commissar of the 38th Army’s 336th Regiment, who relayed the request to command headquarters, which agreed to grant safe passage for the students to the southeast. The commissar told Hou, “it would be a tremendous accomplishment, if you can persuade the students to leave the Square. At 4 am, the lights on the Square suddenly turned off, and the government’s loudspeaker announced: “Clearance of the Square begins now. We agree with the students’ request to clear the Square.” The students sang The Internationale and braced for a last stand. Hou returned and informed student leaders of his agreement with the troops. At 4:30 am, the lights relit and the troops began to advance on the Monument from all sides. At about 4:32 am, Hou Dejian took the student’s loudspeaker and recounted his meeting with the military. Many students, who learned of the talks for the first time, reacted angrily and accused him of cowardice. Some of the students and professors persuaded others still sitting on the lower tiers of the Monument to get up and leave, while soldiers beat them with clubs and gunbutts and prodded them with bayonets. Witnesses heard bursts of gunfire. At about 5:10 am, the students began to leave the Monument. They linked hands and marched through a corridor to the southeast, though some departed through the north. Those who refused to leave were beaten by soldiers and ordered to join the departing procession. Having removed the students from the square, soldiers were ordered to relinquish their ammunition, after which they were allowed a short reprieve from 7 am to 9 am. The soldiers were then ordered to clear the square of all debris left over from the student occupation. The debris was either piled and burnt on the square, or placed in large plastic bags that were airlifted away by military helicopters. After the cleanup, the troops stationed at The Great Hall of the People remained confined within for the next nine days. During this time, the soldiers were left to sleep on the floors and fed a single packet of instant noodles split between three men daily. Officers apparently suffered no such deprivation, and were served regular meals apart from their troops. Just past 6 am on June 4, as a convoy of students who had vacated the Square were walking westward in the bicycle lane along Chang’an Avenue back to campus, three tanks pursued them from the Square, firing tear gas and one drove through the crowd, killing 11 students, injuring scores. Later in the morning, thousands of civilians tried to re-enter the Square from the northeast on East Chang’an Avenue, which was blocked by rows of infantry. Many in the crowd were parents of the demonstrators who had been in the Square. As the crowd approached the troops, an officer sounded a warning, and the troops opened fire. The crowd scurried back down the avenue in view of journalists in the Beijing Hotel. Dozens of civilians were shot in the back as they fled. Later, the crowds surged back toward the troops, who opened fire again. The people fled in panic. An ambulance that was arriving was also caught in the gunfire. The crowd tried several more times but could not enter the Square, which remained closed to the public for two weeks. 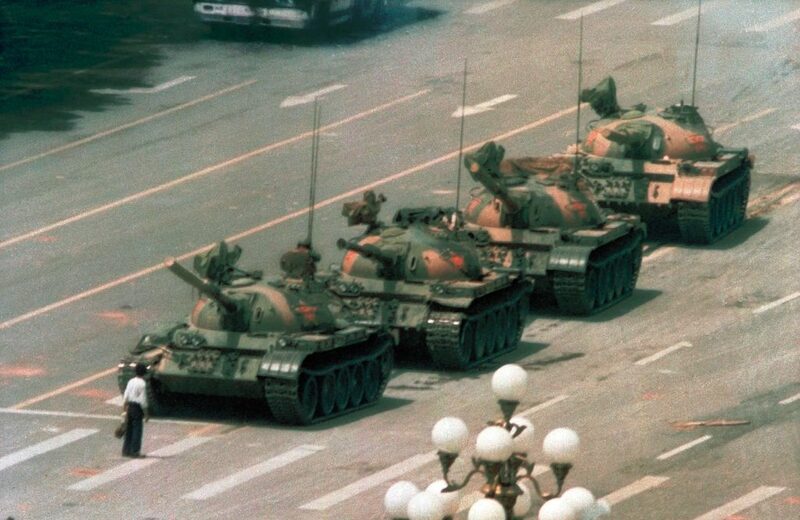 On 5 June, suppression of the protest was immortalized in Western media by the famous video footage and photographs of a lone man standing in front of a column of tanks driving out of Tiananmen Square. The iconic photo that would eventually make its way around the world was taken on 5 June on Chang’an Avenue. As the tank driver tried to go around him, the “Tank Man” moved into the tank’s path. He continued to stand defiantly in front of the tanks for some time, then climbed up onto the turret of the lead tank to speak to the soldiers inside. After returning to his position in front of the tanks, the man was pulled aside by a group of people. A stopped convoy of 37 APCs on Changan Boulevard at Muxidi was forced to abandon their vehicles after becoming stuck among an assortment of burned out buses and military vehicles. In addition to occasional incidents of soldiers opening fire on civilians in Beijing, Western news outlets reported clashes between Units of the PLA. Late in the afternoon 26 tanks, three armored personnel carriers and supporting infantry took up defensive positions facing East at Jianguomen and Fuxingmen overpasses. Shellfire was heard throughout the night and the next morning a United States Marine in the Eastern part of the city reported spotting a damaged armored vehicle that had been disabled by an armor-piercing shell. The ongoing turmoil in the capital disrupted the flow of everyday life. No editions of the People’s Daily were available in Beijing on 5 June despite assurances that they had been printed. Many shops, offices, and factories were not able to open as workers remained in their homes, and public transit services were limited to Subway and suburban bus routes. By and large, the government regained control in the week following the military’s seizure of the Square. A political purge followed in which officials responsible for organizing or condoning the protests were removed, and protest leaders jailed. After order was restored in Beijing on 4 June, protests of varying scales continued in some 80 other Chinese cities, outside of the spotlight the international press. In the British colony of Hong Kong, people again took to wearing black in solidarity with the demonstrators in Beijing. There were also protests in other countries, many adopting the use of black armbands as well. In Shanghai, students marched on the streets on 5 June and erected roadblocks on major thoroughfares. Factory workers went on a general strike and took to the streets as well; railway traffic was also blocked. Public transport was also suspended and prevented people from getting to work. On 6 June, the municipal government tried to clear the rail blockade, but it was met with fierce resistance from the crowds. Several people were killed by being run over by the train. On 7 June, students from major Shanghai universities stormed various campus facilities to erect biers in commemoration of the dead in Beijing. The situation gradually came under control without use of deadly force. The municipal government gained recognition from the top leadership in Beijing for averting a major upheaval. In the interior cities of Xi’an, Wuhan, Nanjing and Chengdu, many students continued protests after 4 June, often erecting roadblocks. In Xi’an, students stopped workers from entering factories. In Wuhan, students blocked the Yangtze River Railway bridge and another 4,000 gathered at the railway station. About one thousand students staged a railroad ‘sit-in’. Rail traffic on the Beijing-Guangzhou and Wuhan-Dalian lines was interrupted. The students also urged employees of major state-owned enterprises to go on strike. In Wuhan the situation was so tense that residents reportedly began a bank run and resorted to panic-buying. Similar scenes unfolded in Nanjing. On 7 June, hundreds of students staged a blockade at the Nanjing Yangtze River Bridge as well as the Zhongyangmen Railway Bridge. They were persuaded to evacuate without incident later that day, though returned the next day to occupy the main railway station and the bridges. The atmosphere in Chengdu was more violent. On the morning of 4 June, police forcibly broke up the student demonstration taking place in Chengdu’s main square. The resulting violence killed eight people, and injured hundreds. The most brutal attacks occurred on 5 and 6 June. Witnesses estimate that 30 to 100 bodies were thrown onto a truck after a crowd broke into the Jinjiang Hotel. According to Amnesty International, at least 300 people were killed in Chengdu on 5 June. Troops in Chengdu used concussion grenades, truncheons, knives and electroshock weapon against civilians. Hospitals were ordered to not accept students and on the second night the ambulance service was stopped by police. ” and over “2,000 civilians, including the handful of lawless ruffians and the onlooking masses who do understand the situation.” Military spokesperson Zhang Gong stated that no one was killed in Tiananmen Square and no one was run over by tanks in the Square. On 9 June, Deng Xiaoping, appearing in public for the first time since the protests began, delivered a speech praising the “martyrs” (PLA soldiers who had died). Deng stated that the goal of the movement was to overthrow the party and the state. “Their goal is to establish a totally Western-dependent bourgeois republic”, Deng said of the protesters. Deng argued that protesters had complained about corruption to cover their real motive, which was to replace the socialist system. He said that “the entire imperialist Western world plans to make all socialist countries discard the socialist road and then bring them under the monopoly of international capital and onto the capitalist road”. The civilians killed in the city of Beijing, according to the city police, “included university professors, technical people, officials, workers, owners of small private enterprises, retired workers, high school students and grade school students, of whom the youngest was nine years old.”[better source needed] The number of deaths and the extent of bloodshed in the Square itself have been in dispute since the events. As the Chinese authorities actively suppress discussion of the events as well as research of the subject, it is difficult to verify exact figures. As a result, large discrepancies exist among various casualty estimates. Official Chinese government announcements put the number of dead between zero and 300. However, current Chinese government reports deny the protests entirely. At the State Council press conference on 6 June, spokesman Yuan Mu said that “preliminary tallies” by the government showed that about 300 civilians and soldiers died, including 23 students from universities in Beijing, along with a number of people he described as “ruffians”. Yuan also said some 5,000 soldiers and police along with 2,000 civilians were wounded. On June 19, Beijing Party Secretary Li Ximing reported to the Politburo that the government’s confirmed death toll was 241, including 218 civilians (of which 36 were students), 10 PLA soldiers and 13 People’s Armed Police, along with 7,000 wounded. At an official Chinese Ministry of Defence briefing to foreign military attachés on 28 July, 38th Army Political Chief Li Zhiyun claimed that no one had been killed at Tiananmen. United States government files declassified in 2014 estimated there had been 10,454 deaths and 40,000 injured. This figure was from internal Chinese government files obtained from the Chinese government headquarters in Zhongnanhai. In British government files declassified and made public in December 2017, it was revealed that Alan Ewen Donald, who served as the United Kingdom’s ambassador to China from 1988 to 1991, had reported in 1989 that a member of the State Council of the People’s Republic of China had estimated the civilian death toll at 10,000. Other estimates of the death toll have been higher than the figures announced by the government. Nicholas D. Kristof, then Beijing bureau chief for The New York Times, wrote on 21 June that “it seems plausible that about a dozen soldiers and policemen were killed, along with 400 to 800 civilians.” United States ambassador James Lilley said that, based on visits to hospitals around Beijing, a minimum of several hundred had been killed. In a 1990 article addressing the question, Time magazine said that the Chinese Red Cross had given a figure of 2,600 deaths on the morning of 4 June, though later this figure was retracted. A declassified National Security Agency cable filed on the same day estimated 180–500 deaths up to the morning of 4 June.Amnesty International‘s estimates puts the number of deaths at between several hundred and close to 1,000, while a Western diplomat who compiled estimates put the number at 300 to 1,000. Wu Renhua of the Chinese Alliance for Democracy, an overseas group agitating for democratic reform in China, said that he was only able to verify and identify 15 military deaths. Wu asserts that if deaths from events unrelated to demonstrators were removed from the count, only seven deaths among military personnel may be counted as those “killed in action” by rioters. The authorities carried out mass arrests. Many workers were summarily tried and executed. In contrast, the students—many of whom came from relatively affluent backgrounds and were well-connected—received much lighter sentences. Wang Dan, the student leader who topped the most wanted list, spent seven years in prison. Many of the students and university staff implicated were permanently politically stigmatized, some never to be employed again. Some student leaders such as Chai Ling and Wuer Kaixi were able to escape to the United States, the United Kingdom, France and other Western nations under Operation Yellowbird that was organized from Hong Kong, a British territory at the time. Smaller protest actions continued in other cities for a few days. Some university staff and students who had witnessed the killings in Beijing organized or spurred commemorative events upon their return to school. At Shanghai’s prestigious Jiaotong University, for example, the party secretary organized a public commemoration event, with engineering students producing a large metal wreath. According to the Dui Hua Foundation, citing a provincial government, 1,602 individuals were imprisoned for protest-related activities in the early 1989. As of May 2012, at least two remain incarcerated in Beijing and five others remain unaccounted for. In June 2014, it was reported that Miao Deshun was believed to be the last known prisoner incarcerated for their participation in the protests; he was last heard from a decade ago. All are reported to be suffering from mental illness. The Party leadership expelled Zhao Ziyang from the Politburo Standing Committee (PSC). Hu Qili, another PSC member who opposed the martial law but abstained from voting, was also removed from the committee. He was, however, able to retain his party membership, and after “changing his opinion”, was reassigned as deputy minister in the Ministry for Machinery and Electronics Industry. Another reform-minded Chinese leader, Wan Li, was also put under house arrest immediately after he stepped out of his plane at Beijing Capital Airport upon returning from his shortened trip abroad; the authorities declared his detention to be on health grounds. When Wan Li was released from his house arrest after he finally “changed his opinion” he, like Qiao Shi, was transferred to a different position with equal rank but a mostly ceremonial role. Several Chinese ambassadors abroad claimed political asylum. Jiang Zemin, then Party Secretary of Shanghai, was promoted to General Secretary of the Communist Party. Jiang’s decisive actions in Shanghai involving the World Economic Herald and his having prevented deadly violence in the city won him support from party elders in Beijing. Having put the new leadership team in place and recognising his weakened position, Deng Xiaoping himself also bowed out of the party leadership—at least officially—by resigning his last leadership position as Chairman of the Central Military Commission later that year. He kept a low profile until 1992. According to diplomatic cables de-classified by Canada, the Swiss ambassador informed Canadian diplomats in confidence that over several months following the massacre, “every member of the Politburo Standing Committee has approached him about transferring very significant amounts of money to Swiss bank accounts”. Bao Tong, Zhao Ziyang’s aide, was the highest-ranking official to be formally charged with a crime in connection with 1989 demonstrations. He was convicted in 1992 of “revealing state secrets and counter-revolutionary propagandizing” and served seven years in prison. To purge sympathizers of Tiananmen demonstrators among the party’s rank-and-file, the party leadership initiated a one-and-a-half-year-long rectification program to “deal strictly with those inside the party with serious tendencies toward bourgeois liberalization”. Four million people were reportedly investigated for their role in the protests. More than 30,000 Communist officers were deployed to assess ‘political reliability’ of more than one million government officials. The authorities arrested tens if not hundreds of thousands of people across the country. Some were seized in broad daylight while they walked in the street; others were arrested at night. Many were jailed or sent to labor camps. They were often denied access to see their families and often put in cells so crowded that not everyone had space to sleep. Dissidents shared cells with murderers and rapists, and torture was not uncommon. The suppression on June 4 marked the end of a period of relative press freedom in China and media workers—both foreign and domestic—faced heightened restrictions and punishment in the aftermath of the crackdown. State media reports in the immediate aftermath were sympathetic to the students. As a result, those responsible were all later removed from their posts. Two news anchors Xue Fei and Du Xian, who reported this event on June 4 in the daily Xinwen Lianbo broadcast on China Central Television were fired because they displayed sad emotions. Wu Xiaoyong, the son of former foreign minister Wu Xueqian was removed from the English Program Department of Chinese Radio International, ostensibly for his sympathies towards protesters. Editors and other staff at People’s Daily, including director Qian Liren and Editor-in-Chief Tan Wenrui, were also sacked because of reports in the paper which were sympathetic towards the protesters. Several editors were arrested. With the imposition of martial law, the Chinese government cut off the satellite transmissions of western broadcasters such as CNN and CBS. Broadcasters tried to defy these orders by reporting via telephone. Footage was quickly smuggled out of the country. The only network which was able to record shots during the night of 4 June was Televisión Española of Spain (TVE). During the military action, some foreign journalists faced harassment from authorities. CBS correspondent Richard Roth and his cameraman were taken into custody while filing a report from the Square via mobile phone. Several foreign journalists who had covered the crackdown were expelled in the weeks that followed while others were harassed by authorities or blacklisted from reentering the country. In Shanghai, foreign consulates were told that the safety of journalists who failed to heed newly enacted reporting guidelines could not be guaranteed. The USC U.S.-China Institute’s Assignment: China series includes a segment on American media coverage of the protests and their suppression. Tiananmen Square features interviews with correspondents for the Associated Press and United Press International, The New York Times, The Washington Post, The Wall Street Journal, Time, the Voice of America, ABC, CBS and CNN. A replica of the memorial in the Polish city of Wrocław depicting a destroyed bicycle and a tank track as a symbol of the Tiananmen Square protests. The original was destroyed by Security Service despite the fact that it was after the 1989 elections. The Chinese government’s response was widely denounced, particularly by Western governments and media. Criticism came from both Western and Eastern Europe, North America, Australia and some west Asian and Latin American countries. Many Asian countries remained silent throughout the protests; the government of India responded to the massacre by ordering the state television to pare down the coverage to the barest minimum, so as not to jeopardize a thawing in relations with China, and to offer political empathy for the events. Cuba, Czechoslovakia and East Germany, among others, supported the Chinese government and denounced the protests. Overseas Chinese students demonstrated in many cities in Europe, America, the Middle East and Asia. On 13 June 1989, the Beijing Public Security Bureau released an order for the arrest of 21 students who they identified as leaders of the protest. These 21 most wanted student leaders were part of the Beijing Students Autonomous Federation which had been an instrumental student organization in the Tiananmen Square protests. Immediately after the release of the list, only 7 out of the 21 Most Wanted escaped China, with assistance from the Hong-Kong based organization Operation Yellowbird. Though decades have passed, the Most Wanted list has never been retracted by the Chinese government. The illegal organization “Beijing Students Autonomous Federation” instigated and organized the counter-revolutionary rebellion in Beijing. It is now decided to pursue 21 of its head and key members, including Wang Dan. After receiving this order, please immediately arrange investigation work. If found, immediate arrest the targets and inform the Beijing Public Security Bureau. The 21 most wanted student leaders faces and descriptions were broadcast on television as well and were constantly looped. Photographs with biographical descriptions of the 21 Most Wanted followed in this order on the poster: Wang Dan, Wuer Kaixi , Liu Gang, Chai Ling, Zhou Fengsuo, Zhai Weimin, Liang Qingdun, Wang Zhengyun, Zheng Xuguang, Ma Shaofang, Yang Tao, Wang Zhixing, Feng Congde,Wang Chaohua, Wang Youcai, Zhang Zhiqing, Zhang Boli, Li Lu, Zhang Ming, Xiong Wei, and Xiong Yan. Arrests were also broadcast, such as that of Most Wanted No. 21 Xiong Yan. Each of the 21 students faced diverse experiences after their arrests or escapes; while some remain abroad with no intent to return, others have chosen to stay indefinitely such as Zhang Ming. Only 7 of the 21 were able to escape, the remainder of the 21 student leaders were apprehended and incarcerated. Zhou Fengsuo was turned in by his own sister and arrested on 13 June 1989 in Xi’an. He was imprisoned for one year before being released in 1990 due to international pressures, along with 97 other political prisoners. Some served longer sentences than others, such as Wang Dan, one of the most visible leaders during the protests topping the most wanted list. Wang Dan continued his activist efforts after his parole release and was subsequently sentenced to 11 years for subversion. Liu Gang, who was arrested in Baoding in mid June, attempted to organize his fellow prisoners in defiance, by conducting a hunger strike. He had his arms lashed behind his back in a harsh position for several days while in prison. Many of those who initially escaped from the most wanted list were assisted by Operation Yellowbird and fled to the West. Those who escaped remain in exile today and have opened up about their experiences. Zhang Boli, number 17 on the list wrote a book titled “Escape From China” that details his experience during the protests and his escape. Those who escaped, whether it was in 1989 or after, generally have had difficulty re-entering China, even up to this day. The Chinese government prefers to leave the dissidents in exile. Those who attempt to re-enter, such as Wu’er Kaixi, have been simply sent back, but not arrested. In 2009, Xiong Yan, number 21 on the list, returned to China with a visit to Hong Kong, a special administrative region of China, in order to mark the 20th anniversary the Tiananmen protests. Xiong Yan spent 19 months in jail, after his release he fled to the United States where he keeps in touch with Tiananmen activists and participates in pro-democracy events. Xiong was invited to the southern Chinese enclave by the Hong Kong Alliance, which has been holding annual candlelight vigils on the 4 June anniversary Tiananmen protests. Many of the 21 who are in exile have joined human rights organizations or are now engaging in private business. Among the student leaders, Wang Dan and Zhao Changqing were arrested. As a lesser figure in the demonstrations, Zhao was released after six months in prison. However, he was once again incarcerated for continuing to petition for political reform in China. Wang Dan was sent to prison, then allowed to emigrate to the United States in 1998 on the grounds of medical parole. He eventually received a PhD from Harvard University and went on to teach modern Chinese history at National Tsing Hua University in Hsinchu, Taiwan. Wu’erkaixi fled to Taiwan and has since become a political commentator on Taiwanese national radio.Chai Ling fled to France and then went on to the United States to study at Princeton and Harvard. She then founded an IT start-up company and a non-profit organization called All Girls Allowed, which addresses issues such as women’s rights and female infanticide in China. Li Lu became an investment banker and venture capitalist on Wall Street, started his own hedge fund and became a business partner to Charlie Munger of Berkshire Hathaway, partly through human rights contacts he was acquainted with as a result of his involvement at Tiananmen Square. Chen Ziming and Wang Juntao were arrested in late 1989 for their involvement in the 1989 Tiananmen Square protests. Chinese authorities alleged they were the “black hands” behind the movement. Both Chen and Wang rejected the allegations made against them. They were put on trial in 1990 and sentenced to 13 years in prison. Not all of the 21 most wanted are as well known as Chai Ling or Wang Dan. Others such Zhang Zhiqing have essentially disappeared. After his initial arrest in January 1991 and subsequent release, nothing further is known about his situation and where he lives now. Zhang Zhiqing’s role and reason for being listed on the list of 21 most wanted is generally unknown; this is the case for many others on the list such Wang Chaohua. Other dissidents that are not as well known to the public include Zhou Fengsuo and Wang Zhengyun. Zhou Fengsuo was a physics student at Tsinghua University and a member of the Standing Committee of the Beijing Students Autonomous Federation during the protests. Fengsuo was turned in by his sister and arrested on June 13, 1989 in Xi’an. He was imprisoned for one year before being released in 1990 due to international pressures, along with 97 other political prisoners. Leaving China for the United States, he attended the University of Chicago. Steady in his activist roots he co-founded Humanitarian China, an organization that promotes rule of law in China and also raises money for Chinese political prisoners. Wang Zhengyun was a student of the Central University for Nationalities and was the only member of the Kucon ethnicity minority group to be studying at a university. Zhengyun was arrested in July 1989 and released two years later. He was sent back to his village in the Yunnan countryside. In December 1998, Wang was one of 19 dissidents, including Zhai Weimin, who staged a hunger strike to protest the oppression of CDP members and other dissidents. Ma Shaofang and Yang Tao are another pair of dissidents that lack public attention despite their constant activist efforts. Ma Shaofang was a student of the Beijing Film Academy during the protests and turned himself in on 13 June 1989. In October 1990 he was sentenced to three years in prison for counterrevolutionary incitement. In May 1994, he participated with Wang Dan and other dissidents in a petition to the National People’s Congress calling for a reassessment of 4 June. He has had issues in attempting to open a business and has had a series of short lived jobs ever since and is living in Shenzhen. Yang Tao, who was at one time the head of Beijing University’s Autonomous Student Federation, remains in China today. He was initially charged as being an instigator of the counterrevolutionary rebellion and imprisoned for one year on 16 June 1989. In 1998, he wrote an open letter asking for the release of Wang Youcai. His continued efforts landed him in prison in 1999 after lobbying for the government to reverse the labeling of the protest as a “counterrevolutionary rebellion”. He was originally arrested on charges of “incitement to overthrow state political power.” However, he was indicted on amended charges of tax evasion on 23 December due to lack of evidence and on 5 January 2003 was sentenced to four years in prison. He was released in May 2003. Yang too has had trouble earning a living. The protests led to a strengthened role for the state. In its aftermath, many of the freedoms introduced during the 1980s were rescinded, as the party returned to a conventional Leninist mold and re-established firm control over the press, publishing, and mass media. The protests were also a blow to the separation of powers model established by the 1982 Constitution and by convention, whereby the President was a symbolic position (figurehead), and the real centres of power of the General Secretary of the Communist Party, the Premier of the State Council and the Chairman of the Central Military Commission were intended to be different people, to prevent the excesses of Mao-style personal rule. However, when President Yang Shangkun asserted his reserve powers with his post of Central Military Commission and openly split with general secretary Zhao Ziyang over the use of force to side with Premier Li Peng and Central Military Commission chairman Deng Xiaoping, official policy became inconsistent and incoherent, significantly impeding the exercise of power. In 1993, the positions of General Secretary, Central Military Commission Chairman and President were all consolidated into the same office, reverting to the previous Maoist distribution of power that had previously existed since 1972. In 1989, neither the Chinese military nor the Beijing police had sufficient anti-riot gear, such as rubber bullets and tear gas. After the Tiananmen Square protests, riot police in Chinese cities were equipped with non-lethal equipment for riot control. The protests led to increased spending on internal security and expanded the role of the People’s Armed Police in suppressing urban protests. The aftermath of the protests saw the resurgence of conservative attitudes towards reform among policymakers, intended to slow the rapid changes that were said to have contributed to the causes of the protest. Deng Xiaoping, the “architect” of the reform policy, saw his influence significantly reduced following the protests, forcing him into making concessions with socialist hardliners. In dismissing Zhao Ziyang, who shared Deng’s vision for economic reform but disagreed with him over politics, Deng had lost the foremost champion of his own economic vision. Facing pressure from the conservative camp, Deng distanced himself from state affairs. This slow pace of reform was met with stiff resistance from provincial governors and broke down completely in the early 1990s as a result of the dissolution of the Soviet Union and Deng’s Southern Tour of 1992, designed by the ailing but influential leader as a means to reinstate his economic reform agenda. On the tour, Deng criticized the leftist hardliners that had gained power following the protests, and praised entrepreneurship and other market-driven policies. Initially ignored by Beijing, the Chinese Politburo eventually sided with Deng and economic reforms again gained prominence. In Hong Kong, the Tiananmen square protests led to fears that China would renege on its commitments under one country, two systems following the impending handover of Hong Kong from the United Kingdom in 1997. In response, Governor Chris Patten tried to expand the franchise for the Legislative Council of Hong Kong, which led to friction with Beijing. For many Hong Kongers, Tiananmen served as a turning point for when they lost trust in the Beijing government. The event, coupled with general uncertainty about the status of Hong Kong after the transfer of sovereignty, led to a sizeable exodus of Hong Kongers to Western countries such as Canada and Australia prior to 1997. There have been large candlelight vigils attended by tens of thousands in Hong Kong every year since 1989 even after the transfer of power to China in 1997. The June 4th Museum closed in July 2016, after only two years in its location. The group that runs the museum, the Hong Kong Alliance, has started to crowdfund money to open the museum in a new location. The Chinese government drew widespread condemnation for its suppression of the protests. In its immediate aftermath, China seemed to be becoming a pariah state, increasingly isolated internationally. This was a significant setback for the leadership, who had courted international investment for much of the 1980s as the country emerged from the chaos of the Cultural Revolution. However, Deng Xiaoping and the core leadership vowed to continue economic liberalization policies after 1989. From there on, China would work domestically as well as internationally to reshape its national image from that of a repressive regime to a benign global economic and military partner. During the early 1990s, officials such as Yang Shangkun, Li Peng and others sought to return to a planned economy. Deng Xiaoping largely stayed out of politics until his groundbreaking 1992 “southern tour”, which was intended to re-instate policies of economic liberalization. Along with the liberalization came the loosening of state control in many areas of daily life. Privately run print media flourished. Private newspapers increased from 250 in the 1980s to over 7,000 by 2003. Provincially run satellite TV stations sprung up all over the country and challenged the market share of state-run CCTV. The leadership also stepped away from promoting communism as an all-encompassing belief system. State-approved religious organizations increased their membership significantly, and traditional beliefs suppressed during the Mao era re-appeared. This state-sanctioned plurality also created the environment for unsanctioned forms of spirituality and worship to grow. In order to reduce the need for controversial methods of state control, while Protestants, Buddhists, and Taoists were largely left alone, the state often used these ‘approved’ denominations to “fight against cults” such as Falun Gong, playing sects off each other. As the party departed from the orthodox communism it was founded upon, much of its attention was focused on the cultivation of nationalism as an alternative ideology. This policy largely succeeded in tying the party’s legitimacy to China’s “national pride”, turning public opinions in its favour. This is perhaps most prominently seen in May 1999, when the United States bombed the Chinese embassy in Belgrade. The bombings saw an outpouring of nationalist sentiment and increased support for the party as the foremost advocate of China’s national interest. Facing global condemnation for their handling of the protests in 1989, China has endeavored to demonstrate its willingness to participate in international economic and defense institutions in order to secure investment for continued economic reforms. Before the end of 1991, China normalized ties with the Russian government’s newly elected president, Boris Yeltsin. China also welcomed Taiwanese business as a replacement for Western investment. Further, China expedited negotiations with the World Trade Organization as well as established relations with Indonesia, Israel, South Korea and others in 1992. Regarding defense alignments, the government signed the Non-Proliferation Treaty in 1992, the Convention on Chemical Weapons in 1993 and the Comprehensive Test Ban Treaty in 1996. Whereas China had been a member of just 30 international organizations in 1986, this membership increased to over 50 by 1997. Finally, while China was a net recipient of aid throughout the 1980s, its growing economic and military role transformed it into a provider of aid, with $100 million given to Thailand in 1997 alone. Furthermore, the government has successfully promoted China as an attractive destination for investment by emphasizing the country’s skilled workers, comparatively lower wages, established infrastructure, and sizeable consumer base. Increased foreign investment in the country led many world leaders to believe that by constructively engaging China in the global marketplace, political reforms would inevitably follow. At the same time, the explosion of commercial interest in the country opened the way for multinational corporations to turn a blind eye to politics and human rights in favour of doing business. Since then, Western leaders who were previously critical of China have generally paid lip service to the legacy of Tiananmen, but the substance of bilateral relationships focus on business and trade interests. In Hong Kong, the events of Tiananmen in 1989 have become permanently etched in the public consciousness, perhaps more than anywhere else outside mainland China. The events continue to have a strong impact on perceptions of China, its government, attitudes towards democracy, and the extent to which Hong Kongers should identify as Chinese. The events of 4 June are seen as emblematic of the Chinese brand of authoritarianism and is prominently discussed in Hong Kong’s political circles, often in relation to democratic reform in Hong Kong and the territory’s relationship with Beijing. Academic studies indicate that those who supported the rehabilitation of the Tiananmen Square movement had a tendency to support democratization in the territory as well as the election of pro-democracy parties. There was a significant impact on the Chinese economy after the incident. The ramifications of the Tiananmen Square protests led to changes in China’s economic direction, and these reverberated not only internationally, but also domestically from within the Chinese government themselves. These events led to the Chinese government concentrating power, especially over the direction of the economy. While there was a slowdown immediately after the massacre, the economy quickly rebounded during the 1990s. After the Tiananmen Square protests, many analysts downgraded their outlook of China’s economic future. The Chinese Communist Party’s response to the protests was one of the factors that led to a delay in China’s acceptance to the World Trade Organization and China did not become a member until twelve years later on 11 December 2001. Furthermore, bilateral aid to China decreased from $3.4 billion in 1988 to $1.5 billion in 1989, and to $0.7 billion in 1990. Loans to China were suspended by the World Bank, Asian Development Bank, and foreign governments; tourism revenue decreased from US$2.2 billion to US$1.8 billion; foreign direct investment commitments were cancelled and there was a rise in defense spending from 8.6% in 1986, to 15.5% in 1990, reversing a previous 10 year decline. Although the Bush administration had wanted to normalize and improve relations with China, the violent crackdown of the protests on June 4, 1989, led to his administration banning all sales of weapons to China on June 5. Similar to the Bush administrations initiatives, other countries imposed their own sanctions in response to Tiananmen. By July 1989, the G7 had halted $10 billion in foreign aid, loans from Japan as well as $780 million in bank loans by the World Bank for the end of June. These coordinated actions hurt the Chinese economy, leading to a decline in international investment, a reduction in the number of tourists, as well as a decline in China’s credit rating. However, most of these sanctions were eased and lifted by the early 1990s and China’s economy rebounded. Because of the mainly negative world reaction to China’s Tiananmen response, as well as internal conflict regarding whether China should continue on a path of economic liberalization, leadership in China pursued a self-imposed enforcement of party discipline. Although political liberals were purged from the Chinese Communist Party, many of those who were economically liberal remained. This led to a restructuring within the Chinese Communist Party. Even though more reformed-minded leaders such as Zhao Ziyang were purged from the Communist Party ranks by leaders like Deng Xiaoping, the economically liberal side prevailed as it helped the Chinese economy regain and later surpass the slowdown it had experienced after the Tiananmen Square protests. Deng was of the main forces behind China’s economic reform. Chinese Premier Li Peng visited the United Nations Security Council on 31 January 1992 and argued that the economic and arms embargoes on China were a violation of national sovereignty. The European Union and United States embargo on armament sales to China, put in place as a result of the violent suppression of the Tiananmen Square protests, remains in place today. China has been calling for a lift of the ban for years and has had a varying amount of support from European Union members. Since 2004, China has portrayed the ban as “outdated” and damaging to China–European Union relations. In early 2004, French President Jacques Chirac spearheaded a movement within the European Union to lift the ban, which was supported by German Chancellor Gerhard Schröder. However, the passing of the Anti-Secession Law of the People’s Republic of China in March 2005 increased tensions between mainland China and Taiwan, damaging attempts to lift the ban and several European Union Council members retracted their support for a lift of the ban. Moreover, Schröder’s successor Angela Merkel opposed lifting the ban. Members of the United States Congress had also proposed restrictions on the transfer of military technology to the European Union if the latter lifted the ban. The United Kingdom also opposed the lifting of the embargo when it took charge of the European Union presidency in July 2005. In addition, the European Parliament has consistently opposed the lifting of the arms embargo to China. Though its agreement is not necessary for lifting the ban, many argue it reflects the will of the European people better as it is the only directly elected European body. The arms embargo has limited China’s options from where it may seek military hardware. Among the sources that were sought included the former Soviet bloc that it had a strained relationship with as a result of the Sino-Soviet split. Other willing suppliers have previously included Israel and South Africa, but American pressure has restricted this co-operation. The Communist Party of China forbids discussion of the Tiananmen Square protests and has taken measures to block or censor related information. Textbooks have little, if any, information about the protests. After the protests, officials banned controversial films and books, and shut down many newspapers. Within a year, 12% of all newspapers, 8% of publishing companies, 13% of social science periodicals and more than 150 films were banned or shut down. The government also announced it had seized 32 million contraband books and 2.4 million video and audio cassettes. Access to media and Internet resources on the subject are restricted or blocked by censors. Banned literature and films include Summer Palace,Forbidden City, Collection of June Fourth Poems,The Critical Moment: Li Peng diaries and any writings of Zhao Ziyang or his aide Bao Tong, including Zhao’s memoirs. However, contraband and Internet copies of these publications can be found. The party’s official stance towards the incident is that the use of force was necessary in order to control a “political disturbance” and that it ensured the stability necessary for economic prosperity. Chinese leaders, including former paramount leadersJiang Zemin and Hu Jintao, reiterate this line when questioned by foreign press. Public memory of the Tiananmen Square protests has been suppressed by the authorities since 1989. Print media containing reference to the protests must be consistent with the government’s version of events. Currently, many Chinese citizens are reluctant to speak about the protests because of potential repercussions. Rob Gifford held that many young people born after 1980 are unfamiliar with the events and are apathetic about politics. Youth in China are generally unaware of the events, of the symbols such as tank man, or of the significance of the date June 4 itself. Some older intellectuals no longer aspire for political change and instead focus on economic issues. While public discussion of the events has become a social taboo, private discussions continue to take place despite frequent interference and harassment from the authorities. Nobel Peace Prize laureate Liu Xiaobo remained in China to speak out about Tiananmen in the 1990s despite offers of asylum; he faced constant surveillance. Zhang Xianling and Ding Zilin, mothers of victims who lost their lives in 1989, founded the Tiananmen Mothers organization and were particularly outspoken on the humanitarian aspects of the subject. The authorities mobilize security forces, including members of the People’s Armed Police, every year on June 4 to prevent public displays of remembrance, with especially heavy security for major anniversaries such as the 20th anniversary in 2009 and the 25th anniversary in 2014. Journalists have been frequently denied entry to the Square on anniversaries. In addition, the authorities are known to have detained foreign journalists and increase surveillance on prominent human rights activists during this time of year. Internet searches of 4 June Tiananmen Square made within China return censored results or result in temporarily severed server connections. Specific web pages with select keywords are censored while other websites, such as those of overseas Chinese democracy movements, are blocked wholesale. The censorship, however, has been inconsistent—with many sites being blocked, unblocked and re-blocked over the years, including YouTube, Wikipedia and Flickr. In addition, the policy is much more stringent with Chinese-language sites than foreign-language ones. Social media censorship is more stringent during anniversaries; even oblique references to the protests are usually deleted within hours. In January 2006, Google agreed to censor their mainland China site to remove information about Tiananmen and other subjects considered sensitive by the authorities. Google withdrew its cooperation on censorship in January 2010. Over the years some Chinese citizens have called for a reassessment of the protests and compensation from the government to victims’ families. One group in particular, Tiananmen Mothers, seeks compensation, vindication for victims and the right to receive donations from within the mainland and abroad. Zhang Shijun, a former soldier who was involved in the military crackdown, had published an open letter to President Hu Jintao seeking to have the government reevaluate its position on the protests. He was subsequently arrested and taken from his home. Although the Chinese government never officially acknowledged relevant accusations when it came to the incident, in April 2006 a payment was made to the mother of one of the victims, the first publicized case of the government offering redress to a Tiananmen-related victim’s family. The payment was termed a “hardship assistance”, given to Tang Deying (唐德英) whose son Zhou Guocong (simplified Chinese: 周国聪; traditional Chinese: 周國聰) died at age 15 years while in police custody in Chengdu on 6 June 1989, two days after the Chinese Army dispersed the Tiananmen protesters. She was reportedly paid CNY70,000 (approximately US$10,250). This has been welcomed by various Chinese activists, but it was regarded by some as a measure to maintain social stability and not believed to herald a changing of the party’s official position. Before his death in 1998, Yang Shangkun told army doctor Jiang Yanyong that 4 June was the most serious mistake committed by the Communist Party in its history, a mistake that Yang himself could not correct, but one that certainly will eventually be corrected. Zhao Ziyang remained under house arrest until his death in 2005. Zhao’s aide Bao Tong has repeatedly called on the government to reverse the verdict for the demonstrations. Chen Xitong, the mayor of Beijing, who read the martial law order and was later disgraced by a political scandal, expressed regret for the death of innocent civilians in 2012, a year before his death. Premier Wen Jiabao reportedly suggested reversing the government’s position on Tiananmen in party meetings prior to his departure from politics in 2013, only to be rebuffed by his colleagues. 1989, provide information on the persons who are still detained from that period, inform the family members of their findings, offer apologies and reparation as appropriate and prosecute those found responsible for excessive use of force, torture and other illtreatment. In 1995, Richard Gordon and Carma Hinton produced The Gate of Heavenly Peace an award-winning three-hour documentary film about the Tiananmen Square protests. The film contains interviews with Liu Xiaobo, Wang Dan, Wu’erkaixi, Han Dongfang, Ding Zilin, Chai Ling, Dai Qing, Feng Congde, and Hou Dejian. The same year saw the release of Moving the Mountain a feature documentary directed by Michael Apted and produced by Trudie Styler, with cinematography by Maryse Alberti. The film takes its title from the memoir by Li Lu, one of the student leaders of the Tiananmen Square protests. Though Li Lu is a central figure in the finished film, the project set out to provide a comprehensive understanding of the events leading up to and following the protests and features many other interviews. A primetime special hosted by Tom Brokaw honored both the Tiananmen Square pro-democracy demonstrations in Beijing and the fall of the Berlin Wall in 1989, a momentous year for human rights around the world. In April 2006, the PBS series Frontline produced an episode titled The Tank Man, which examined his role in the 1989 Tiananmen Square Protests and the change that has overtaken China economically and politically since. On 3 June 2009, the BBC aired the documentary Kate Adie returns to Tiananmen in which documented reporter Kate Adie‘s return to China, where Adie recalls the events she witnessed in 1989. In May 1998, Indonesian general Prabowo Subianto threatened “Tiananmen Square massacre” style in Jakarta to suppress student-led demonstrations against President Suharto. In February 2011, Libyan leader Muammar Gaddafi, in response to an uprising in Benghazi against his rule, held up China’s 1989 military assault on Tiananmen Square as an example of how to deal with popular unrest. Chinese media censored Gaddafi’s reference to Tiananmen Square. Since Tiananmen, the iconic “Tank Man” image has become a worldwide symbol for civil disobedience. What happened to the “Tank Man” following the demonstration is not known. Some say he was pulled away and went into hiding, others say he was executed by the authorities.Time dubbed him “The Unknown Rebel” and later named him one of the 100 most influential people of the 20th century. In an interview with United States media, then Chinese paramount leader Jiang Zemin said he did not think the man was killed. Ren Jianmin (Victim No. 106), was a farmer from Hebei who was passing through the city and wounded by gunfire in the stomach on June 4. He was unable to afford medical bills and hanged himself in August because of unbearable pain. Zou Bing (Victim No. 51), a 19-year-old student at the Beijing Broadcasting Institute, hanged herself in September 1989 because of her inability to pass interrogation into her involvement in the protest. Qi Li, (Victim No. 162), a student at the Central Academy of Drama, hanged himself to escape the pressure of post-protest investigation at his school. Wei Wumin (Victim No. 163), also a student at the Central Academy of Drama, who participated in the hunger strike, committed suicide by standing in front of an oncoming train. List of casualties, Ding Zilin. Retrieved May 21, 2007 (in Chinese). Jay Mathews, former Beijing bureau chief for The Washington Post said that “as far as can be determined from the available evidence, no one died that night in Tiananmen Square”. He goes on to conclude: A few people may have been killed by random shooting on streets near the square, but all verified eyewitness accounts say that the students who remained in the square when troops arrived were allowed to leave peacefully. Hundreds of people, most of them workers and passersby, did die that night, but in a different place and under different circumstances. Richard Roth reported that he was held captive by troops in the Great Hall of the People on the west side of the Square on the night of 3 June and could hear but not see into the Square until dawn when they were driven through the Square. He heard a “volley of gunfire” to silence the students’ loudspeakers. 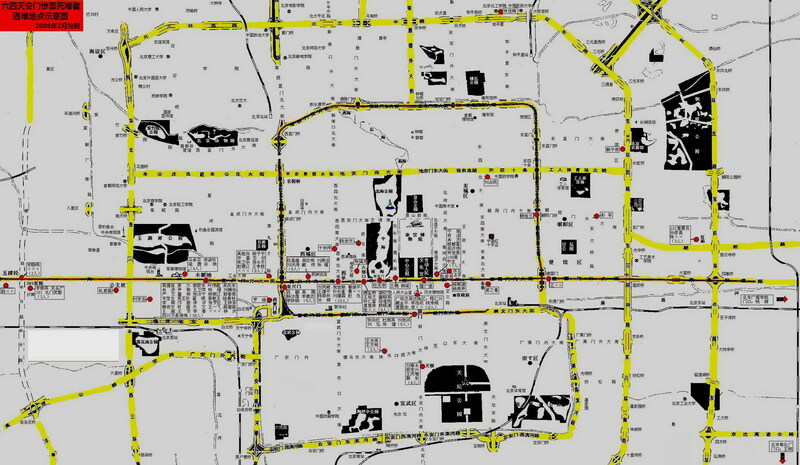 He added that there is no doubt that many people were killed in the area on the way to and around the Square, mostly in western Beijing, which the Chinese government denies. Richard Bernstein (4 June 1989). “In Taiwan, Sympathies Lean Toward Home“. The New York Times. Cheng, Kris (21 December 2017). “Declassified: Chinese official said at least 10,000 civilians died in 1989 Tiananmen massacre, documents show”. Hong Kong Free Press. Retrieved 22 December 2017. Lusher, Adam (24 December 2017). “At least 10,000 people died in Tiananmen Square massacre, secret British cable from the time”. The Independent. Retrieved 24 December 2017. Kristoff, Nicholas D. (June 21, 1989). “A Reassessment of How Many Died in the Military Crackdown in Beijing”. The New York Times. Jan Wong, Red China Blues, Random House 1997, p. 278. Nathan, Andrew J. (January–February 2001). “The Tiananmen Papers”. Foreign Affairs. Archived from the original on July 6, 2004. Retrieved November 3, 2010. Anthony Saich, The People’s Movement: Perspective on Spring 1989 M.E. Sharpe 1990, ISBN9780873327466. p. 172. Miles, James (June 2, 2009). “Tiananmen killings: Were the media right?”. BBC News. Retrieved January 15, 2012. “Declassified British cable” (PDF). Retrieved January 6, 2017. “Clayton Dube, Talking Points, June 3–18, 2014”. China.usc.edu. Retrieved 2018-10-22. Miles, James (1997). The Legacy of Tiananmen: China in Disarray. University of Michigan Press. ISBN978-0-472-08451-7. p. 28. “”The Consequences of Tiananmen”, Andrew J. Nathan”. Resetdoc.org. Retrieved 2018-10-22. Goodman, David S. G. (1994). Deng Xiaoping and the Chinese revolution. Psychology Press. ISBN978-0-415-11252-9. p. 112. “China tightens information controls for Tiananmen anniversary”. The Age. Australia. Agence France-Presse. June 4, 2009. Retrieved November 3, 2010. Vogel, Ezra F. (2011). Deng Xiaoping and the Transformation of China. Belknap Press of Harvard University Press. p. 634. ISBN978-0-674-05544-5. “The day China trampled on freedom”. The Age. Australia. May 30, 2009. Retrieved November 3, 2010. Lim, Louisa (2015). People’s Republic of Amnesia. Oxford University Press. p. 183. ISBN978-0190227913. Dingxin Zhao. The Power of Tiananmen: State-Society Relations and the 1989 Beijing Student Movement. Chicago: University of Chicago Press, 2001. ISBN0226982602. p. 127. Wang, Hui, Thomas Huters ed. China’s New Order: Society, Politics, and Economy in Transition. Cambridge, MA: Harvard Press, 2003. ISBN0-674-02111-8. p. 54. “The Gate of Heavenly Peace”. Long Bow Group Inc. in collaboration with ITVS. 1995. Retrieved January 15, 2012. Wang, Hui, Thomas Huters ed. China’s New Order: Society, Politics, and Economy in Transition. Cambridge, MA: Harvard Press, 2003. ISBN0-674-02111-8. pp. 56–57. Spence, Jonathan D. (1999). The Search for Modern China. p. 685. New York: Norton. Calhoun, Craig. “Revolution and repression in Tiananmen square” (PDF). Pan, Philip P. (2008). Out of Mao’s Shadow: The Struggle for the Soul of a New China. Simon & Schuster. p. 274. ISBN978-1-4165-3705-2. Walder, Andrew W., and Gong Xiaoxia. “Workers in the Tiananmen Protests: The Politics of the Beijing Workers’ Autonomous Federation”. Australian Journal of Chinese Affairs, no. 29, January 1993. pp. 1–2. Li, Peng (2010). “21 April Entry”. Li Peng Diary: The Critical Moments. Hong Kong: Au Ya Publishing. ISBN978-1-921815-00-3. Zhao, Ziyang (2009). “The origins of the 1989 Student Movement”. Prisoner of the State: The Secret Journal of Premier Zhao Ziyang. Simon & Schuster. ISBN978-1-4391-4938-6. Liu, Alan P.L. (May 1990). “Aspects of Beijing’s Crisis Management: The Tiananmen Square Demonstration”. Asian Survey. 5. 30 (5): 505–21. doi:10.1525/as.1990.30.5.01p0385c. JSTOR2644842. “Full text of the April 26 Editorial”. Xinhua News Agency. February 23, 2005. Archived from the original on April 24, 2006. Amnesty International (August 30, 1989). Preliminary Findings on Killings of Unarmed Civilians, Arbitrary Arrests and Summary Executions Since June 3, 1989. p. 19. Li, Peng. Diary entry for 15 May. Li, Peng (2010). “Entry for 17 May”. The Critical Moment – Li Peng Diaries. Hong Kong: Au Ya Publishing. ISBN978-1-921815-00-3. Nathan, Andrew (2002). “On the Tiananmen Papers”. Foreign Affairs. 80 (1): 2–48. doi:10.2307/20050041. JSTOR20050041. Miles, J.A.R. (1997). The Legacy of Tiananmen: China in Disarray. University of Michigan Press. ISBN978-0-472-08451-7. Ignatius, Adi. “Preface”. In Zhao Ziyang. Prisoner of the State: The Secret Journal of Premier Zhao Ziyang. Trans & Ed. Bao Pu, Renee Chiang, and Adi Ignatius. New York: Simon & Schuster. 2009. ISBN1-4391-4938-0. p.x. Exiled Tiananmen dissident back in Taiwan[dead link]. Yahoo! News. June 4, 2009. Ignatius, Adi. “Preface”. In: Zhao Ziyang, Prisoner of the State: The Secret Journal of Premier Zhao Ziyang. New York: Simon & Schuster. 2009. ISBN1-4391-4938-0. p. xv. dragonmui. “Playlist of “Democratic Songs for China””. YouTube.com. Retrieved 2018-10-22. Brook, Timothy (1998). Quelling the People: The Military Suppression of the Beijing Democracy Movement. Stanford: Stanford University Press. pp. 80–82. ISBN978-0-8047-3638-1. “Secretary of State’s Morning Summary for 3 June 1989”. George Washington University. Retrieved August 4, 2008. “The Gate of Heavenly Peace”. ITVN, The Ford Foundation, the Rockefeller Foundation. Retrieved January 13, 2012. Michael Fathers. (June 3, 1989). “Moveable Feast Starts Again on Tiananmen Square”. The Independent. Retrieved November 19, 2010, from LexisNexis. Jay Mathews. (June 2, 1989). “Chinese Army Moving Closer to Protesters: Finances, Leadership Split Student Ranks”. The Washington Post. Retrieved November 19, 2010, from ProQuest Historical Newspapers The Washington Post (1877–1994). (Document ID: 734005592). (Chinese) Wu Renhua, “天安门广场清场命令的下达” 《1989天安门事件二十周年祭》之五. Retrieved June 30, 2013. (Chinese) Wu Renhua, “戒严部队的挺进目标和路线” 《1989天安门事件二十周年祭》系列之十三. Retrieved June 30, 2013. Nicholas Kristof. (June 3, 1989). “Beijing Residents Block Army Move Near City Center: Tear Gas said to be Fired”. The New York Times. Retrieved November 19, 2010, from ProQuest Historical Newspapers The New York Times (1851–2007). (Document ID: 115057724). “Interview with Timothy Brook”. Pbs.org. 2006-04-11. Retrieved November 9, 2009. “Interview with John Pomfret”. Pbs.org. 2006-04-11. Retrieved November 9, 2009. (Chinese) “调停者段昌隆之死” Tiananmen Mothers. Retrieved July 2, 2013; Duan was the grand nephew of the warlord Duan Qirui, whose troops were responsible for the March 18 Massacre of 1926, the deadliest use of force against students in Beijing until 1989. Lim, Louisa (2014). The People’s Republic of Amnesia: Tiananmen Revisited. New York: Oxford University Press. p. 23. ISBN978-0-19-022791-3. Lim, Louisa (2014). The People’s Republic of Amnesia: Tiananmen Revisited. New York: Oxford University Press. p. 19. ISBN978-0-19-022791-3. Lilley, James (July 12, 1989). “Latin American Diplomat Eyewitness Account of June 3–4 Events on Tiananmen Square”. WikiLeaks. Retrieved April 2, 2016. Lim, Louisa (2014). The People’s Republic of Amnesia: Tiananmen Revisited. New York: Oxford University Press. pp. 25–26. ISBN978-0-19-022791-3. “Interview with Jan Wong”. PBS. April 11, 2006. Retrieved November 9, 2009. “Frontline: The Tank Man transcript”. Brook, Timothy (1992). Quelling the People: The Military Suppression of the Beijing Democracy Movement. New York: Oxford University Press. pp. 178–179. ISBN978-0-19-507457-4. Nicholas D. Kristof, “Units Said to Clash: Troops in Capital Seem to Assume Positions Against an Attack”, The New York Times, June 6, 1989, A1. Brook, Timothy (1992). Quelling the People:The Military Suppression of the Beijing Democracy Movement. New York: Oxford University Press. p. 190. ISBN978-0-19-507457-4. Nicholas D. Kristof, “Units Said to Clash: Troops in Capital Seem to Assume Positions Against an Attack”, The New York Times, June 6, 1989, A14. Jan Wong, “Troops Brace for Attack in Beijing”, The Globe and Mail, June 6, 1989, A1. Tsui, Anjali; Pang, Esther. “China’s Tiananmen activists: Where are they now?”. CNN. Retrieved 2017-05-01. “Tianamen Square: Ageing rebels, bitter victims”. The Economist citing Louisa Lim. May 31, 2014. Retrieved June 3, 2014. BBC Shanghai City Service, “Public Transport Suspended, Roads Barricaded in Shanghai”, June 6, 1989, BBC Summary of World Broadcasts,. Zhang 2001, pp. 399, 404. Lim, Louisa (2014-04-15). “After 25 Years of Amnesia”. Npr.org. Retrieved 2018-10-22. Cheng, Chu-Yuan (1990). Behind the Tiananmen Massacre: Social, Political and Economic Ferment in China. p. 139. Westview Press, Inc., Oxford. Oksenberg, Sullivan & Lambert 1990, p. 364. Oksenberg, Sullivan & Lambert 1990, pp. 361–67. Deng Xiaoping (June 9, 1989). 在接见首都戒严部队军以上干部时的讲话 (in Chinese). Xinhua News Agency. Archived from the original on August 27, 2008. “Deng’s June 9 Speech: ‘We Faced a Rebellious Clique’ and ‘Dregs of Society'”. The New York Times. June 30, 1989. Retrieved May 1, 2012. Lin, Chong-Pin; Xiaoping, Deng (June 28, 1989). “Deng’s 9 June Speech”. World Affairs. 3. 152 (3): 154–58. JSTOR20672226. Oksenberg, Sullivan & Lambert 1990, p. 378. Frontline – The Memory of Tiananmen 1989. PBS. 2006. “Chinese official said 10,000 died in 1989”. 2017-12-27. “美國機密檔案：六四屠殺10454人｜壹週刊”. Nextplus.nextmedia.com. 1980-01-01. Retrieved 2018-10-22. “10,000 killed in China’s 1989 Tiananmen crackdown: British archive”. Yahoo! News. 23 December 2017. Lusher, Adam (24 December 2017). “At least 10,000 people died in Tiananmen Square massacre, secret British cable from the time”. the Independent. London. Lilley, James, China Hands, 322. “Secretary of State’s Morning Summary for 4 June 1989”. George Washington University. Retrieved August 4, 2008. “China: 15 years after Tiananmen, calls for justice continue and the arrests go on”. Amnesty International. Retrieved May 30, 2009. Jay Mathews (September–October 1998). “The Myth of Tiananmen”. Columbia Journalism Review. “There was no “Tiananmen Square Massacre”, CBS News. An English translation of the Tiananmen Mothers’ Database – Note: contains incorrect English spellings of some victims’ names. “Not Forget Us” Accessed June 20, 2013. Liu, Melinda (April 1996). “Article: Still on the wing; inside Operation Yellowbird, the daring plot to help dissidents escape. (special report: China)”. Newsweek. Harron, Celia (2014-06-03). “Miao Deshun: China’s last Tiananmen prisoner?”. BBC News. Retrieved 23 September 2014. Beijing Orders Its Ambassadors Home for a Meeting, The New York Times, June 29, 1989. Phillips, Tom (2015-01-27). “Fresh details of ‘savage’ Tiananmen massacre emerge in embassy cables”. Telegraph.co.uk. Retrieved 2018-10-22. Miles, James (1997). The Legacy of Tiananmen: China in Disarray. University of Michigan Press. ISBN978-0-472-08451-7. pp. 27–30. “北京避谈1989年天安门屠杀纪念日 (Chinese)”. Voice of America (China). June 4, 2018. Retrieved 8 June 2018. See Assignment:China – Tiananmen Square for footage of the shutting down of CNN. Bregolat, Eugenio (June 4, 2007). “TVE in Tiananmen”. La Vanguardia (in Spanish). Archived from the original on June 25, 2009. Retrieved September 4, 2007. Roth, Richard (February 11, 2009). “Remembering Tiananmen Square”. CBS. Michael Fathers, “China in Crisis: Reporting continues, but for how long?”, The Independent, June 10, 1989. Nicholas Kristof, “Beijing Ousts 2 American Correspondents”, The New York Times, June 14, 1989. See Assignment: China – Tiananmen Square for interviews with Al Pessin (VOA) and John Pomfret (AP), both of whom were expelled. Michael Bociurkiw, “Shanghai student leaders prepare offensive despite crackdown”, The Globe and Mail, June 12, 1989. “Assignment: China – Tiananmen Square”. USC Annenberg. USC US-China Institute. May 31, 2014. Renmin ribao (People’s Daily), June 14, 1989, 2. Cheng, Eddie (June 13, 2012). “Document of 1989: 21 Most Wanted Student Leaders”. Standoff at Tiananmen. Archived from the original on 2018-04-13. Lim, Louisa (2015). The People’s Republic of Amnesia: Tiananmen Revisited. Oxford University Press. pp. 70–71. Lim, Louisa (2015). The People’s Republic of Amnesia: Tiananmen Revisited. Oxford University Press. p. 74. Lim, Louisa (2015). The People’s Republic of Amnesia: Tiananmen Revisited. Oxford University Press. p. 39. Kristof, Nicholas D (June 14, 1989). “TURMOIL IN CHINA; Moderates Appear on Beijing TV, Easing Fears of Wholesale Purge”. New York Times. Archived from the original on 2018-04-13. Chai, Ling (2011). A Heart for Freedom. Tyndale House Publishers. p. 207. Mosher, Stacy (May 26, 2004). “Tiananmen’s Most Wanted—Where Are They Now?”. HRI China. Archived from the original on 2018-04-13. Xiaoqing, Rowena (2014). Tiananmen Exiles: Voices of the Struggle for Democracy in China. Palgrave Macmillan. pp. 14–15. “Guilt by Association, More Documents from the Chinese Trials” (PDF). www.hrw.org. Asia Watch. July 25, 1991. Archived from the original (PDF) on 2018-04-15. Lim, Louisa (2015). The People’s Republic of Amnesia: Tiananmen Revisited. Oxford University Press. pp. 40–42. Boli, Zhang (1998). Escape From China. Washington Square Press. Lim, Louisa (2015). The People’s Republic of Amnesia: Tiananmen Revisited. Oxford University Press. pp. 73–76. Traywick, Catherine A. (November 25, 2013). “Why China Refuses to Arrest its ‘Most Wanted’ Dissidents”. Foreign Policy. Archived from the original on 2018-04-13. Leitsinger, Miranda (June 4, 2009). “One of Tiananmen’s ‘most wanted’ returns to China”. CNN. Archived from the original on 2018-04-15. Listening to China’s DissidentsArchived June 28, 2011, at the Wayback Machine, Bloomberg BusinessWeek, December 17, 2001. Pulliam, Susan (2010-07-30). “From Tiananmen Square to Possible Buffett Successor”. The Wall Street Journal. Weber, Bruce (2014-10-25). “Chen Ziming, Dissident in China, Is Dead at 62”. The New York Times. ISSN0362-4331. Retrieved 2017-10-29. Cheng, Eddie (2009). Standoff At Tiananmen. Sensys Corp. p. 276. Jacobs, Andrew (June 3, 2014). “Tiananmen’s Most Wanted”. Sinosphere, New York Times. Archived from the original on 2018-04-15. “Where Are Some of the “Most Wanted” Participants Today?”. Human Rights Watch Asia. May 24, 2004. Archived from the original on 2018-04-16. “Where Are Some of the “Most Wanted” Participants Today?”. Human Rights Watch Asia. May 24, 2005. Archived from the original on 2018-04-16. Chinese human rights official says the crackdown ‘completely correct’ Rebecca MacKinnon, “Tiananmen Ten Years Later.” CNN, June 2, 1999. Kam, Vivian (2016-07-11). “Hong Kong’s Tiananmen Museum to close”. CNN. Archived from the original on 2017-01-11. Retrieved 2017-01-11. Deng et al., “Minutes of the CCP Central Politburo Standing Committee Meeting”, in The Tiananmen Papers: The Chinese Leadership’s Decision to use Force Against their own People – In their Own Words, eds. Zhang Liang, Andrew J. Nathan, and Perry Link (New York: Perseus, 2001), 424. Jean-Pierre Cabestan, “How China Managed to De-Isolate Itself on the International Stage and Re-Engage the World after Tiananmen”, in The Impact of China’s 1989 Tiananmen Massacre, ed. Jean-Philippe Beja (New York: Routledge, 2011), 194. Cabestan, “How China Managed to De-Isolate Itself”, 195. Kurlantzick, “The Dragon Still Has Teeth”, 50. Kurlantzick, “The Dragon Still Has Teeth”, 52. Cabestan, “How China Managed to De-Isolate Itself”, 199. Cabestan, “How China Managed to De-Isolate Itself”, 201. Link, “June Fourth: Memory and Ethics”, 30. Link, “June Fourth: Memory and Ethics”, 19. Cabestan, “How China Managed to De-Isolate Itself”, 196. Cabestan, “How China Managed to De-Isolate Itself”, 198. Kurlantzick, “The Dragon Still Has Teeth”, 56. Kurlantzick, “The Dragon Still Has Teeth”, 55. Lee 2012, pp. 152, 155. Naughton, Barry (2010). Béja, Jean-Philippe, ed. The Impact of China’s 1989 Tiananmen Massacre. Routledge. ISBN978-1136906848. Barry, Naughton (2007). The Chinese economy : transitions and growth. Cambridge, MA: MIT Press. ISBN978-0262640640. OCLC70839809. Foot, Rosemary (2000). Rights beyond borders : the global community and the struggle over human rights in China. New York: Oxford University Press. ISBN978-0198297765. OCLC47008462. Thakur, M., Burton, G.E. & Srivastava, B.N. International Management: Concepts and Cases. Tata McGraw-Hill, 1997. pp. 404–05. ISBN978-0-07-463395-3. Kelley, N.L. & Shenkar, O. International Business in China. Routledge, 1993. pp. 120–22. ISBN978-0-415-05345-7. Mann, Jim (1991-06-30). “Many 1989 U.S. Sanctions on China Eased or Ended”. Los Angeles Times. ISSN0458-3035. Retrieved 2018-04-16. Diplomat, Wu Wei, The. “Why China’s Political Reforms Failed”. The Diplomat. Retrieved 2018-04-16. Gordon, W.C. The United Nations at the Crossroads of Reform. M.E. Sharpe, 1994. p. 167. ISBN978-1-56324-400-1. “Japan concerned by call to lift China embargo – official”Archived November 28, 2007, at the Wayback Machine, Forbes, November 27, 2008. “Alexa Olesen”. Associated Press. Archived from the original on May 12, 2011. Retrieved December 2, 2010. Pei, M. (1994). From Reform to Revolution: The Demise of Communism in China and the Soviet Union. Harvard University Press. p. 152. ISBN978-0-674-32563-0. Higgins, Charlotte (September 5, 2006). Director hailed at Cannes faces five-year film ban in China. The Guardian. China: ban on anthology of poems about Tiananmen Square movementArchived June 9, 2009, at the Wayback Machine. Reporters Without Borders. September 7, 2007. Trying times for journalists in China, Asia Times Online, August 29, 2006. “China’s Youth post-Tiananmen: Apathy a fact or front?”. CNN. Retrieved July 28, 2012. “Young clerk let Tiananmen ad slip past censors: paper”. Reuters. June 6, 2007. Retrieved August 5, 2008. Gifford, Rob. “No Longer Relying on Heaven.” China Road. 167–68. “Security tight on Tiananmen Anniversary: China clamps down on Web access 20 years after bloody crackdown” MSNBC/Associated Press, June 3, 2009. Wines, Michael (January 14, 2010). “Far-Ranging Support for Google’s China Move”. The New York Times. Retrieved September 18, 2010. “China makes 1989 Tiananmen payout”. BBC News. April 30, 2006. Buckley, Chris. “Chen Xitong, Beijing Mayor During Tiananmen Protests, Dies at 82”. Retrieved June 6, 2014. Anderlini, Jamil (March 20, 2013). “Wen lays ground for Tiananmen healing”. Retrieved June 6, 2014. 5. Committee Against Torture, “Consideration of Reports Submitted by States Parties Under Article 19 of the Convention: China”, CAT/C/CHN/CO/4, p. 8, para. 21. “Consideration of Reports Submitted by States Parties Under Article 19 of the Convention: Comments by the Government of the People’s Republic of China concerning the Concluding Observations and Recommendations of the Committee Against Torture”, Committee Against Torture, CAT/C/CHN/CO/4/ADD.2, p. 13, para. 9. “Kate Adie returns to Tiananmen”. BBC. June 3, 2009. “French protests ‘Tiananmen'”. FIN24. March 28, 2006. Archived from the original on March 5, 2008. Retrieved March 29, 2007. Picture Power:Tiananmen Standoff BBC News. Last updated October 7, 2005. Iyer, Pico (April 13, 1998). “Time 100: The Unknown Rebel”. Time. Archived from the original on May 12, 2011. Retrieved May 25, 2010. Binyan, Liu; Ruan Ming; Xu Gang (1989). Tell the World: What happened in China and Why. New York: Random House. ISBN978-0-394-58370-9. OCLC20392647. Black, George; Robin Munro (1993). Black Hands of Beijing: Lives of Defiance in China’s Democracy Movement. New York: John Wiley. ISBN978-0-471-57977-9. OCLC243766880. Calhoun, Craig C (1994). “Science, Democracy, and the Politics of Identity”. In Jeffrey N. Wasserstrom; Elizabeth Perry. Popular Protest and Political Culture in Modern China. Westview Press. pp. 140–47. ISBN978-0-8133-2042-7. OCLC30623957. Cunningham, Philip J. (2010). Tiananmen Moon: Inside the Chinese Student Uprising of 1989. Rowman & Littlefield. ISBN978-0-7425-6673-6. Lee, Francis L.F. (June 2012). “Generational Differences in the Impact of Historical Events: The Tiananmen Square Incident in Contemporary Hong Kong Public Opinion”. International Journal of Public Opinion Research. 24 (2): 141–62. doi:10.1093/ijpor/edr042. Oksenberg, Michel; Sullivan, Lawrence R.; Lambert, Marc, eds. (1990). Beijing Spring, 1989: Confrontation and Conflict: The Basic Documents. Qiao Li. M.E. Sharpe. ISBN978-0765640574. Retrieved July 2, 2013. Salisbury, Harrison (1992). The New Emperors: China in the Era of Mao and Deng. New York: Avon. ISBN978-0-380-72025-5. OCLC28306886. Spence, Jonathan D (1999). “Testing the Limits”. The Search for Modern China. New York: Norton. ISBN978-0-393-97351-8. OCLC39143093. Thomas, Antony (2006). The Tank Man (Video). PBS. Retrieved July 2, 2013. Wong, Jan (1997). Red China Blues: My Long March from Mao to Now. Doubleday. ISBN978-0-385-48232-5. OCLC37690446. Wu, Renhua (2009). 六四事件中的戒严部队 [Military Units Enforcing Martial Law During the June 4 Incident] (in Chinese). Hong Kong: 真相出版社. ISBN978-0-9823203-8-9. Archived from the original on October 17, 2007. Retrieved July 16, 2013. Zhang, Liang (2001). Nathan, Andrew; Link, Perry, eds. The Tiananmen Papers. Public Affairs. ISBN978-1-58648-122-3. Zhang, Liang (pseudonym) (2001). June Fourth: The True Story (in Chinese). Hong Kong: Ming jing chu ban she. ISBN978-1-58648-122-3. OCLC243498894. Peter Li; Marjorie H. Li; Steven Mark (2011). Culture and Politics in China: An Anatomy of Tiananmen Square. Transaction Publishers. ISBN978-1-4128-1199-6. “Voices from Tiananmen”. South China Morning Post.